If you've made a video about Sub Commander, taken a great screenshot or finished an action-packed patrol post about it here! Last edited by TheGeoff; 06-18-2014 at 09:01 AM. 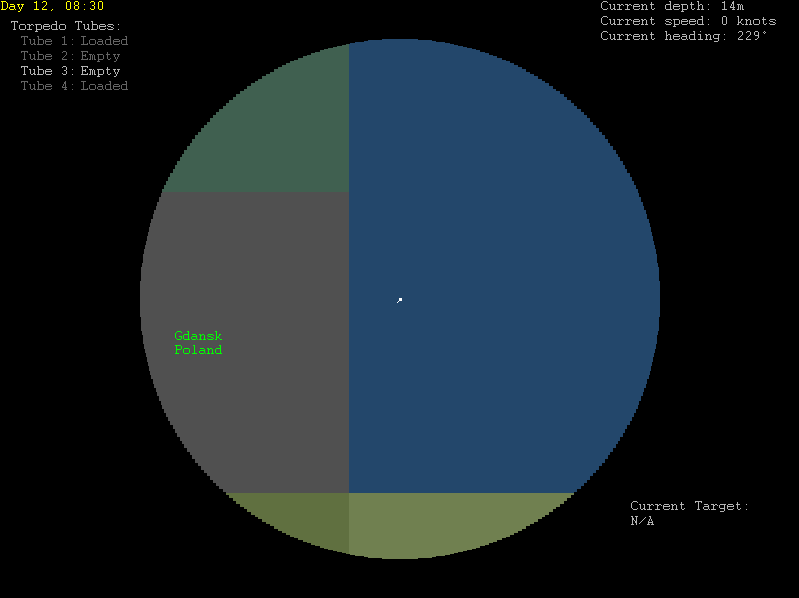 To start us off, here's a 12-day patrol I just played through to make sure version 0.24 is working as intended. Mission log of Polish submarine ORP Kondor. Day 1, 05:50: Patrol started in Gdansk, Poland. Day 2, 14:17: ORP Kondor was attacked with depth charges by FGS Erfurt, a West German Charles F. Adams Class Destroyer. While cruising north through the Danish Straits at periscope depth, a West German Destroyer picks up the ORP Kondor on its hydrophones and moves to engage. Several depth charges explode near the sub but the damage is light. Captain Wiktor Kowinski carefully maneuvers the sub into a firing position then releases a pair of torpedos at the target. The German destroyer evades the first but is struck by the second and explodes. Day 2, 15:01: Ship sunk: FGS Erfurt (West German Charles F. Adams Class Destroyer). The Kondor leaves the sinking ship and continues its mission, passing through Skagerrak and entering the North Sea. Day 2, 15:35: Major fault detected in No. 1 Reactor coolant pump. Suddenly, a faulty weld in the coolant pipes of the No. 1 Reactor cracks, releasing a stream of highly radioactive water into the Reactor Room! The faulty reactor is scrammed immediately, but it is clear that immediate repairs are required as the coolant pressure plummets and the reactor temperature continues to increase. Ensign Ludwik Kaluza bravely volunteers to repair the pipes - equipped with a full radiation suit and gas mask, he enters the irradiated reactor chamber. Though radiation levels are rapidly rising and his suit provides only partial protection, this hero of the Polish Navy refuses to leave until the job is complete. He successfully repairs the pump, but the radiation exposure has taken its toll. He collapses to the ground just after finishing the repairs and is carried to safety by his comrades. They administer first aid but it is clear to everyone that Kazula does not have long to live. He dies early the next morning, having absorbed more than 13Sv of radiation. Day 3, 03:12: Ensign Ludwik Kaluza died of radiation poisoning. A US fast attack submarine! The Kondor quickly fires a torpedo at the contact, scoring a direct hit. Day 6, 04:02: Ship sunk: USS Edenton (US Sturgeon Class Attack Submarine). But the Kondor failed to notice a second US attack submarine lying in wait! The USS Provider unleashes a salvo of torpedoes, two of which hit the starboard side of the Polish submarine. One unlucky crewman is knocked unconscious by the blast and drowns as water pours into the stricken submarine. Day 6, 06:27: Seaman Izydor Filipek drowned. As the crew rush to fight the fires and control the flooding, Captain Kowinski orders the weapons officer to fire all three remaining tubes at the Americans. Although the torpedoes are fired without a proper solution, one miraculously manages to hit the US sub as it attempts a high-speed evasion, destroying it instantly. 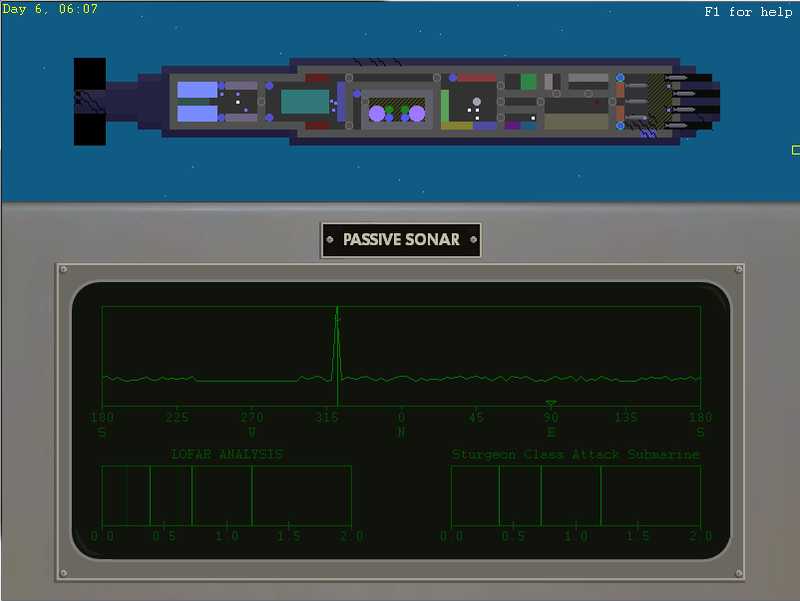 Day 6, 06:29: Ship sunk: USS Provider (US Sturgeon Class Attack Submarine). Day 6, 06:29: ORP Kondor engaged a US battlegroup, sinking the important enemy vessel USS Provider. With the enemy wolfpack sinking into the crushing depths below, the crew of the Kondor focus on avoiding the same fate. The fires are quickly controlled but the gaping holes in the pressure hull quickly cause the aft engine room to flood - the crew hastily abandon the compartment and seal the bulkhead door behind them. Hull damage elsewhere in the ship is fortunately light and the ship is able to limp back to Gdansk for repairs. Day 12, 08:52: Patrol ended at Gdansk, Poland. This shows off a couple of the new features you can expect in 0.24 - improved AI who use teamwork against you, enemy taskforces/wolfpacks patrolling strategic areas, and of course the fancy new map. Last edited by TheGeoff; 06-18-2014 at 09:04 AM. Exciting patrol. But surviving those Torpedoes was a miracle. Mission log of Norwegian submarine HNoMS Göteborg. Day 1, 05:50: Patrol started in Narvik, Norway. Day 5, 19:05: Ship sunk: Wolfsburg (East German Tarantul Class Corvette). Day 8, 18:12: Ship sunk: SS Yi Sun-sin (North Korean Large Cargo Ship). Day 10, 22:43: Ship sunk: SS Elste (East German Oil Tanker). Day 11, 07:07: Ship sunk: SS Frettchen (East German Oil Tanker). Day 11, 07:07: HNoMS Göteborg successfully engaged enemy shipping near 29 N 59 W.
Day 13, 01:39: Turbine generator malfunction. Day 13, 08:04: Ship sunk: MV Madadgar (Libyan Large Cargo Ship). Day 14, 21:55: Ship sunk: SS Daqing (Chinese Small Cargo Ship). Day 15, 15:57: Ship sunk: MV Khybar (Iranian Large Cargo Ship). Day 19, 01:42: Ship sunk: SS Hetteen (Libyan Oil Tanker). Day 19, 03:09: Ship sunk: SS Rasheed (Libyan Large Cargo Ship). Day 19, 07:50: Ship sunk: SS Sultan (Libyan Oil Tanker). Day 19, 07:50: HNoMS Göteborg successfully engaged enemy shipping near 53 N 3 E.
Day 20, 11:38: HNoMS Göteborg docked at Oslo, Norway for refit. Day 25, 11:38: HNoMS Göteborg departed Oslo. Day 29, 14:10: HNoMS Göteborg was fired on by Tambov, a Soviet Victor III Class Attack Submarine. Day 29, 17 Chief Petty Officer William Jönsson died from injuries. Day 29, 17:42: HNoMS Göteborg was fired on by Tambov, a Soviet Victor III Class Attack Submarine. Day 29, 18:18: Seaman Gustav Lind drowned. Day 29, 19:57: Seaman Johan Lindberg died from injuries. Day 29, 21:15: Malfunction in No. 2 Turbine. Day 30, 00:02: Seaman Felix Lundqvist drowned. Day 31, 12:10: HNoMS Göteborg docked at Barcelona, Spain for refit. Day 36, 12:10: HNoMS Göteborg departed Barcelona. Day 40, 03:33: Ship sunk: Kursk (Soviet Sverdlov Class Cruiser). Day 40, 03:35: Ship sunk: Moksha (Soviet Sverdlov Class Cruiser). Day 40, 03:48: HNoMS Göteborg was attacked with depth charges by Slava, a Soviet Koni Class Frigate. Day 40, 04:57: Ship sunk: Nerpal (Soviet Tarantul Class Corvette). Day 40, 05:01: Ship sunk: Volgograd (Soviet Tarantul Class Corvette). Day 40, 05:13: HNoMS Göteborg successfully engaged enemy shipping near 44 N 35 E.
Day 40, 06:01: Ship sunk: Slava (Soviet Koni Class Frigate). Day 43, 07:12: HNoMS Göteborg docked at Rome, Italy for refit. Day 47, 07:12: HNoMS Göteborg departed Rome. Day 47, 13:10: Ship sunk: ORP Wigry (Polish Kashin Class Destroyer). Day 47, 13:26: Patrol ended. That is when I Saved and left. Last edited by Loki_Cat; 10-02-2014 at 08:29 PM. I posted on the other post about a possible diplomacy bug, and I finally decided to test the diplomacy system to the fullest. Mission log of US submarine USS Harrison. Day 1, 05:50: Patrol started in Norfolk, USA. Day 3, 11:12: Ship sunk: Yelna (Soviet Tarantul Class Corvette). Day 3, 11:12: USS Harrison successfully engaged enemy shipping near 43 N 67 W.
Day 6, 23:20: Ship sunk: MV Kunlun (Chinese Small Cargo Ship). Day 9, 21:26: Turbine generator malfunction. Day 10, 04 Lens failure in Periscope. Day 13, 10:20: USS Harrison was attacked with depth charges by Severstal, a Soviet Koni Class Frigate. Day 13, 10:26: Ship sunk: Severstal (Soviet Koni Class Frigate). Day 13, 10:26: USS Harrison engaged a Soviet battlegroup, sinking the important enemy vessel Severstal. Day 13, 10:29: USS Harrison was fired on by Kuznikov, a Soviet Victor III Class Attack Submarine. Day 13, 10:39: Chief Petty Officer Aaron Turner was killed in an explosion. Day 14, 09:18: USS Harrison docked at Barcelona, Spain for refit. Day 21, 09:18: USS Harrison departed Barcelona. Day 22, 21:45: Turbine generator malfunction. Day 32, 17:53: Ship sunk: Wonsan (North Korean Sariwon Class Corvette). Day 32, 17:53: USS Harrison destroyed the important enemy vessel Wonsan. Day 39, 06:25: Fire in the Fore Torpedo Room. Day 39, 07:05: Fire suppression system malfunction in command centre. Day 39, 07:46: Ensign Timothy Wilson died from injuries. Day 42, 00:11: USS Harrison performed reconnaissance of Florianopolis port facilities. Day 44, 16:19: Malfunction in No. 1 Turbine. Day 46, 03:18: Major fault detected in No. 2 Reactor coolant pump. Day 60, 23:15: Malfunction occured in Reactor Core of No. 1 Reactor. Day 63, 14:50: USS Harrison docked at Stanley, United Kingdom for refit. Day 70, 14:50: USS Harrison departed Stanley. However, around day 39 some really weird stuff started happening, it started with my oxygen system not working, so I had to surface and open the main induction valve for the rest of the patrol, and around day 45, I was teleported from the coast of Argentina to the coast of West Africa. All this leads me to believe the USS Harrison is cursed. First post! A failed attack + a self-set challenge = disaster! This is the aftermath of attacking a task force while using periscope + radar, limping away while repairing and getting attacked by nerf guns IRL XD (oh, and ship reliability set to 20 or 15, a little challenge for me: complete 3 missions with the lowest possible reliability ) Salvagable? I think so. And the second reactor heat is going up, even though scramed. The coolant pump is busted as well. I'm trying to get to a port before it goes up in flames! first patrol i did was to unleash all my nukes in a country and thn crash dive as mayhem is going on above my head did i do anything wrong? Morally speaking? haha. At the moment (probably realistically) launching a nuclear missile at any city in the game inevitably sets off a chain of retaliatory strikes which destroys every city on earth. If your submarine survives there is not much left to do except sail the world looking for survivors. Sometimes South American countries or Australia survive the nuclear apocalypse with a couple of cities intact. Ever Since Silent Service 2 came out, I've made use of the save game function when being ordered to do something sketchy like reconning the enemy port of Halifax! That way I can continue the game if Neptune disvavors me!! Mission log of US submarine USS Santa Fe. Day 16, 06:17: Ship sunk: MV Quebec (Canadian Oil Tanker). Day 16, 06:17: USS Santa Fe destroyed the important enemy vessel MV Quebec. Day 16, 06:40: Speed Governor failure in Diesel Generator No. 2. Day 16, 06:44: Ship sunk: SAS Tordonn (South African Sa'ar 4 Class Missile Boat). Day 16, 08:46: Major fault detected in No. 1 Reactor coolant pump. Day 16, 09:46: Ship sunk: SAS Transvaal (South African Sa'ar 4 Class Missile Boat). Day 16, 12:42: USS Santa Fe docked at Norfolk, USA for refit. Day 21, 12:42: USS Santa Fe departed Norfolk. Day 21, 12:43: Patrol ended at Norfolk, USA. Day 1, 05:50: Patrol started in Istanbul, Turkey. Day 13, 18:54: Turbine generator malfunction. Day 13, 23:32: Ship sunk: Sejong (North Korean Sariwon Class Corvette). Day 13, 23:35: Ship sunk: SS Ganggyeong (North Korean Small Cargo Ship). Day 14, 02:25: Fire suppression system malfunction in generator room. Day 14, 03:10: Ship sunk: MV Tongcheon (North Korean Large Cargo Ship). Day 14, 03:10: HMCS Rainbow successfully engaged enemy shipping near 20 N 51 W.
Day 14, 10:22: Ship sunk: Spiro (Egyptian Koni Class Frigate). Mission log of Canadian submarine HMCS Rainbow. Day 14, 16:45: Malfunction in No. 1 Turbine. Day 14, 19:25: HMCS Rainbow docked at Halifax, Canada for refit. Day 20, 19:25: HMCS Rainbow departed Halifax. Day 20, 19:28: Patrol ended at Halifax, Canada. .Mission log of Canadian submarine HMCS Rainbow. Day 1, 05:50: Patrol started in Halifax, Canada. Day 21, 04:11: HMCS Rainbow performed reconnaissance of Buenos Aires port facilities. Day 21, 12:13: Ship sunk: Yangyang (North Korean Sariwon Class Corvette). Day 21, 12:13: HMCS Rainbow destroyed the important enemy vessel Yangyang. Day 21, 15:56: Fire suppression system malfunction in command centre. Day 21, 16:12: HMCS Rainbow performed reconnaissance of Narvik port facilities. Day 21, 22:18: Major fault detected in No. 1 Reactor coolant pump. Day 22, 00 HMCS Rainbow performed reconnaissance of Norfolk port facilities. Day 22, 00:09: Patrol ended. Day 22, 07:04: HMCS Rainbow performed reconnaissance of Valparaíso port facilities. Day 22, 08:23: Ship sunk: SS Máximo Gómez (Cuban Oil Tanker). Day 22, 08:23: HMCS Rainbow destroyed the important enemy vessel SS Máximo Gómez. Day 22, 10:22: HMCS Rainbow performed reconnaissance of Lima port facilities. Day 22, 13:47: Ship sunk: SS Wiratno (Filipino Small Cargo Ship). Day 22, 13:47: HMCS Rainbow successfully engaged enemy shipping near 26 N 88 W.
Day 22, 14:55: Major fault detected in No. 2 Reactor coolant pump. Day 22, 17:59: HMCS Rainbow performed reconnaissance of Lima port facilities. Day 22, 18:34: Patrol ended. Day 22, 20:44: Malfunction in No. 1 Turbine. Day 22, 22:30: Major fault detected in No. 1 Reactor coolant pump. Day 22, 23:02: HMCS Rainbow docked at Stanley, United Kingdom for refit. Day 29, 23:02: HMCS Rainbow departed Stanley. Day 29, 23:40: Seaman Evan Fortin drowned. Day 29, 23:40: Ensign Felix Champagne drowned. Day 29, 23:40: Seaman Eli Morin drowned. Day 29, 23:40: Chief Petty Officer Henri Morin drowned. Day 29, 23:40: Seaman Dylan Perron drowned. Day 29, 23:41: Ensign Ludovic Perreault drowned. Day 22, 20:37: Malfunction in No. 1 Turbine. Day 22, 22:50: HMCS Rainbow performed reconnaissance of Comodoro Rivadavia port facilities. Day 23, 00:27: HMCS Rainbow performed reconnaissance of Buenos Aires port facilities. Day 23, 01:34: Combustion Chamber failure in Diesel Generator No. 1. Day 23, 05:11: Ship sunk: MV Gianfranco (Italian Oil Tanker). Day 23, 06:11: Fire suppression system malfunction in fore torpedo room. Day 23, 09:07: Ship sunk: MV Filigonio (Colombian Oil Tanker). Day 23, 09:08: HMCS Rainbow was attacked with depth charges by ARC Orocue, a Colombian Allen M. Summner Class Destroyer. Day 23, 10:18: HMCS Rainbow docked at Tampa, USA for refit. Day 27, 10:18: HMCS Rainbow departed Tampa. Day 27, 10:28: Patrol ended. Day 27, 12:42: Fire suppression system malfunction in command centre. Day 27, 14:13: Internal Circuits failure in Sonar Equipment. Day 27, 14:41: Ship sunk: Guangzhou (Chinese Luda Class Destroyer). Day 27, 18:59: Malfunction occured in Pressure Vessel of No. 1 Reactor. Day 27, 19:22: Turbine generator malfunction. Day 27, 19:22: Ship sunk: SS (Cuban Oil Tanker). Day 27, 19:23: Ship sunk: (Cuban Koni Class Frigate). Day 27, 21:00: Ship sunk: SS Defensora (Colombian Large Cargo Ship). Day 27, 21:20: Ship sunk: ARC Caldas (Colombian Allen M. Summner Class Destroyer). Day 27, 21:20: HMCS Rainbow destroyed the important enemy vessel ARC Caldas. Day 27, 21:20: Ship sunk: ARC Filigonio (Colombian Allen M. Summner Class Destroyer). Day 27, 22:36: Malfunction in No. 2 Turbine. Day 27, 22:36: Malfunction in No. 1 Turbine. Day 27, 23:18: Malfunction occured in Pressure Vessel of No. 1 Reactor. Day 27, 23:28: HMCS Rainbow docked at Mobile, USA for refit. Day 32, 23:28: HMCS Rainbow departed Mobile. Day 32, 23:31: Patrol ended. Day 33, 01:17: Ship sunk: MV Rosario (Iranian Oil Tanker). Day 33, 01:17: HMCS Rainbow destroyed the important enemy vessel MV Rosario. Day 33, 01:51: Fire suppression system malfunction in command centre. Day 33, 03:31: Ship sunk: ARC 20 de Julio (Colombian Allen M. Summner Class Destroyer). Day 33, 03:31: HMCS Rainbow successfully engaged enemy shipping near 8 N 96 W.
Day 33, 03:56: Major fault detected in No. 2 Reactor coolant pump. Day 33, 06:11: Major fault detected in No. 1 Reactor coolant pump. Day 33, 10:07: Impeller failure in Bilge Pump. Day 33, 10:09: Fire suppression system malfunction in generator room. Day 33, 10:10: Fire in the Fore Torpedo Room. Day 33, 10:10: Seaman Eli Morin was killed in an explosion. Day 33, 10:11: Fire suppression system malfunction in fore torpedo room. Day 33, 10:11: Chief Petty Officer Henri Morin drowned. Day 33, 10:11: Seaman Dylan Perron drowned. Day 33, 10:23: Major fault detected in No. 2 Reactor coolant pump. Day 33, 11:22: HMCS Rainbow docked at Stanley, United Kingdom for refit. Day 37, 11:22: HMCS Rainbow departed Stanley. Day 37, 12:04: Malfunction in No. 2 Turbine. Day 37, 12:04: Fire suppression system malfunction in engine room. Day 37, 12:32: Seaman Eli Morin died from injuries. Day 37, 12:42: Fire suppression system malfunction in fore torpedo room. Day 37, 14:27: HMCS Rainbow docked at Stanley, United Kingdom for refit. Day 43, 14:27: HMCS Rainbow departed Stanley. Day 43, 14:28: Turbine generator malfunction. Day 43, 14:28: Malfunction occured in Pressure Vessel of No. 2 Reactor. Day 43, 14:30: Patrol ended at Stanley, United Kingdom. Day 1, 06:00: Patrol ended. Mission log of US submarine USS Buffalo. Day 1, 08:10: HTP Tank failure in Torpedo Fuel Storage. Day 1, 08:55: Ship sunk: SS Macko (Polish Large Cargo Ship). Day 1, 08:55: USS Buffalo successfully engaged enemy shipping near 17 N 68 W.
Day 1, 14:04: USS Buffalo performed reconnaissance of Valparaíso port facilities. Day 1, 14:09: Malfunction in No. 2 Turbine. Day 1, 18:08: Ship sunk: MV Belgrano (Egyptian Oil Tanker). Day 1, 18:35: failure in . Day 1, 20:21: CRT Display failure in Weapon Systems Control Panel. Day 1, 20:48: Ship sunk: Kuzbass (Soviet Koni Class Frigate). Day 1, 20:48: USS Buffalo destroyed the important enemy vessel Kuzbass. Day 1, 21:14: Malfunction in No. 2 Turbine. Day 2, 00:43: Turbine generator malfunction. Day 2, 01:15: Ship sunk: Podmoskovye (Soviet Kashin Class Destroyer). Day 2, 01:16: Ship sunk: Kashalot (Soviet Victor III Class Attack Submarine). Day 2, 01:16: USS Buffalo was fired on by Arkhangelsk, a Soviet Victor III Class Attack Submarine. Day 2, 01:16: USS Buffalo was attacked with depth charges by Obinsk, a Soviet Kashin Class Destroyer. Day 2, 01:16: USS Buffalo was attacked with depth charges by Magadan, a Soviet Kashin Class Destroyer. Day 2, 01:16: USS Buffalo was attacked with depth charges by Krasnoyarsk, a Soviet Koni Class Frigate. Day 2, 01:16: USS Buffalo was attacked with depth charges by Tunguska, a Soviet Koni Class Frigate. Day 2, 02:40: Seaman Alec McClane drowned. Day 2, 02:55: Chief Petty Officer Mason Steward drowned. Day 2, 03:01: Chief Petty Officer Trevor Martínez drowned. Day 2, 03:02: Seaman Evan Turner drowned. Day 2, 03:02: Chief Petty Officer Hank Wilson drowned. Day 2, 03:02: Seaman Evan Kowalski drowned. Day 2, 03:11: USS Buffalo docked at Los Angeles, USA for refit. Day 9, 03:11: USS Buffalo departed Los Angeles. Day 9, 03:14: Patrol ended. 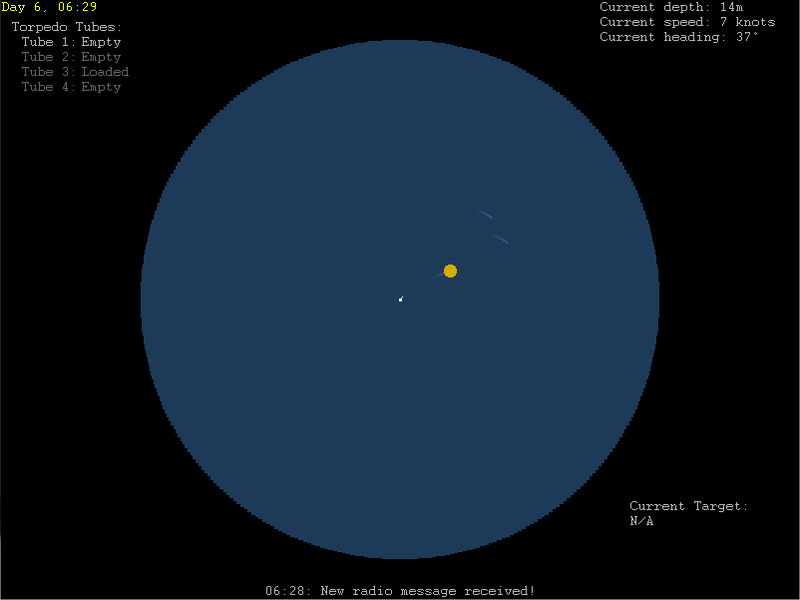 Day 9, 05:00: Internal Circuits failure in Sonar Equipment. Day 9, 06:31: Ship sunk: Obinsk (Soviet Kashin Class Destroyer). Day 9, 06:31: Ship sunk: Krasnoyarsk (Soviet Koni Class Frigate). Day 9, 06:31: Ship sunk: Podmoskovye (Soviet Tarantul Class Corvette). Day 9, 06:31: USS Buffalo was attacked with depth charges by Tunguska, a Soviet Koni Class Frigate. Day 9, 06:31: USS Buffalo was attacked with depth charges by Magadan, a Soviet Kashin Class Destroyer. Day 9, 07:12: Chief Petty Officer Trevor Martínez drowned. Day 9, 07:12: Seaman Evan Turner drowned. Day 9, 07:12: Seaman Evan Kowalski drowned. Day 9, 07:12: Chief Petty Officer Hank Wilson drowned. Day 9, 07:55: Seaman Jesse González drowned. Day 9, 07:55: Ensign Bob Turner drowned. Day 9, 07:55: Seaman Bruce Turner drowned. Day 9, 07:57: Chief Petty Officer Jon González drowned. Day 9, 08:11: USS Buffalo docked at Los Angeles, USA for refit. Day 16, 08:11: USS Buffalo departed Los Angeles. Day 16, 08:13: Malfunction occured in Pressure Vessel of No. 1 Reactor. Day 16, 08:13: Patrol ended. Day 16, 12:26: USS Buffalo was fired on by Petrozavodsk, a Soviet Victor III Class Attack Submarine. Day 16, 12:27: Major fault detected in No. 1 Reactor coolant pump. Day 16, 12:27: Ensign Seth McClane was killed in an explosion. Day 16, 12:27: Lieutenant Joshua Johnson was killed in an explosion. Day 16, 12:27: Patrol ended. Day 16, 09:18: Malfunction in No. 1 Turbine. Day 16, 09:37: Major fault detected in No. 1 Reactor coolant pump. Day 16, 09:37: Fire in the Fore Torpedo Room. Day 16, 10:25: Seaman Evan Kowalski drowned. Day 16, 10:34: Chief Petty Officer Trevor Martínez drowned. Day 16, 10:38: Chief Petty Officer Hank Wilson drowned. Day 16, 10:43: Seaman Evan Turner drowned. Day 16, 12:53: Ensign Bob Turner died of radiation poisoning. Day 16, 13:17: USS Buffalo docked at Los Angeles, USA for refit. Day 23, 13:17: USS Buffalo departed Los Angeles. Day 23, 13:33: CRT Display failure in Weapon Systems Control Panel. Day 23, 13:39: Turbine generator malfunction. Day 23, 13:44: Fuel Injector failure in Diesel Generator No. 2. Day 23, 13:47: Patrol ended. Day 23, 17:45: Turbine generator malfunction. Day 23, 18:31: USS Buffalo performed reconnaissance of Caracas port facilities. Day 23, 19:58: Ship sunk: SS Isku (Finnish Large Cargo Ship). Day 23, 22:25: HTP Tank failure in Torpedo Fuel Storage. Day 24, 01:10: Ship sunk: ARC 11 de Noviembre (Colombian Allen M. Summner Class Destroyer). Day 24, 01:11: Ship sunk: MV Tayrona (Colombian Oil Tanker). Day 24, 01:11: USS Buffalo destroyed the important enemy vessel MV Tayrona. Day 24, 01:37: Patrol ended. Day 24, 02:23: Major fault detected in No. 1 Reactor coolant pump. Day 24, 02:23: Ship sunk: MV Filigonio (Colombian Oil Tanker). Day 24, 02:32: Ship sunk: SS Indomable (Colombian Oil Tanker). Day 24, 02:32: USS Buffalo destroyed the important enemy vessel SS Indomable. Day 24, 06:35: USS Buffalo was fired on by Delfin, a Soviet Victor III Class Attack Submarine. Day 24, 06:35: USS Buffalo was fired on by Voronezh, a Soviet Victor III Class Attack Submarine. Day 24, 06:35: Chief Petty Officer Mason Steward was killed in an explosion. Day 24, 06:35: Ship sunk: Delfin (Soviet Victor III Class Attack Submarine). Day 24, 06:35: Seaman Evan Kowalski was killed in an explosion. Day 24, 06:38: Chief Petty Officer Trevor Martínez drowned. Day 24, 06:38: Chief Petty Officer Hank Wilson drowned. Day 24, 06:38: Seaman Evan Turner drowned. Day 24, 06:42: Seaman Bruce McAllister drowned. Day 24, 06:43: Ensign Seth McClane drowned. Day 24, 06:51: USS Buffalo docked at Mobile, USA for refit. Day 30, 06:51: USS Buffalo departed Mobile. Day 30, 06:54: Patrol ended. Day 30, 09:12: Ship sunk: Iribis (Soviet Koni Class Frigate). Day 30, 09:31: Ship sunk: Kuznetsov (Soviet Kashin Class Destroyer). Day 30, 09:31: USS Buffalo destroyed the important enemy vessel Kuznetsov. Day 30, 11:59: Ship sunk: Yegorlik (Soviet Koni Class Frigate). Day 30, 11:59: Ship sunk: Gepard (Soviet Victor III Class Attack Submarine). Day 30, 11:59: USS Buffalo destroyed the important enemy vessel Gepard. Day 30, 13:53: Ship sunk: Oktyabr (Soviet Kashin Class Destroyer). Day 30, 13:54: Ship sunk: Zelenograd (Soviet Koni Class Frigate). Day 30, 18:30: USS Buffalo docked at Los Angeles, USA for refit. Day 35, 18:30: USS Buffalo departed Los Angeles. Day 35, 18:35: Fire suppression system malfunction in fore torpedo room. Day 35, 18:37: Patrol ended at Los Angeles, USA. Day 35, 23:52: Ship sunk: MV Karel (Filipino Large Cargo Ship). Day 36, 02:17: Fire suppression system malfunction in generator room. Day 36, 02:23: CRT Display failure in Power Systems Control Panel. Day 36, 02:25: Ship sunk: BAP Arica (Peruvian Lupo Class Frigate). Day 36, 02:25: Ship sunk: SS Daiyun (Chinese Small Cargo Ship). Day 36, 02:26: Malfunction in No. 2 Turbine. Day 36, 02:38: Ship sunk: BAP Unanue (Peruvian Lupo Class Frigate). Day 36, 02:38: USS Buffalo successfully engaged enemy shipping near 26 N 94 W.
Day 36, 05:17: Malfunction occured in Control Rods of No. 1 Reactor. Day 36, 05:17: Turbine generator malfunction. Day 36, 10:20: Turbine generator malfunction. Day 36, 10:31: Ship sunk: MV Danube (West German Small Cargo Ship). Day 36, 10:31: USS Buffalo successfully engaged enemy shipping near 68 N 19 W.
Day 36, 14:09: Malfunction in No. 2 Turbine. Day 36, 14:09: Ship sunk: MV Tapajó (Brazilian Large Cargo Ship). Day 36, 14:18: Ship sunk: Tapajó (Brazilian Allen M. Summner Class Destroyer). Day 36, 17:45: USS Buffalo docked at Norfolk, USA for refit. Day 43, 17:45: USS Buffalo departed Norfolk. Day 43, 17:46: Patrol ended at Norfolk, USA. Day 44, 08:42: Ship sunk: Gwanggaeto (North Korean Sariwon Class Corvette). Day 44, 09:48: Malfunction in No. 1 Turbine. Day 44, 16:42: Major fault detected in No. 1 Reactor coolant pump. Day 44, 16:53: Fire in the Fore Torpedo Room. Day 44, 16:54: Lieutenant Seth Alfonso drowned. Day 44, 17 Seaman Evan Kowalski drowned. Day 44, 17Ship sunk: SS Contreras (Mexican Small Cargo Ship). Day 44, 17USS Buffalo destroyed the important enemy vessel SS Contreras. Day 44, 17:07: Lieutenant Joshua Johnson drowned. Day 44, 17:19: Seaman Evan Turner drowned. Day 44, 23:00: USS Buffalo docked at Honolulu, USA for refit. Day 50, 23:00: USS Buffalo departed Honolulu. Day 50, 23:02: Patrol ended at Honolulu, USA. Day 1, 05:50: Patrol started in Honolulu, USA. Day 51, 04:55: Turbine generator malfunction. Day 51, 05:33: Ship sunk: SS Sinsegi (North Korean Large Cargo Ship). Day 51, 05:33: USS Buffalo successfully engaged enemy shipping near 12 N 94 W.
Day 51, 06:26: Ship sunk: MV Katanpää (Finnish Small Cargo Ship). Day 51, 06:26: USS Buffalo successfully engaged enemy shipping near 15 N 100 W.
Day 51, 16:21: USS Buffalo successfully engaged enemy shipping near 57 N 8 E.
Day 51, 19:18: Ship sunk: INS Jalashwa (Indian Tarantul Class Corvette). Day 51, 19:21: Ship sunk: INS Pralaya (Indian Kashin Class Destroyer). Day 51, 19:30: Fire suppression system malfunction in generator room. Day 51, 19:36: Ship sunk: INS Gomati (Indian Tarantul Class Corvette). Day 51, 19:36: USS Buffalo successfully engaged enemy shipping near 76 N 13 E.
Day 52, 00:48: Malfunction occured in Primary Coolant Pipes of No. 1 Reactor. Day 52, 01:18: Turbine generator malfunction. Day 52, 01:41: Ship sunk: SS Atalaya (Spanish Oil Tanker). Day 52, 01:41: USS Buffalo was attacked by a Spanish P-3 Orion. Day 52, 02:12: USS Buffalo docked at Marseille, France for refit. Day 59, 02:12: USS Buffalo departed Marseille. Day 59, 02:13: Patrol ended at Marseille, France. Day 59, 12:28: Ship sunk: MV Vahterpää (Finnish Small Cargo Ship). Day 59, 12:35: Ship sunk: MV Valas (Finnish Oil Tanker). Day 59, 12:37: USS Buffalo performed reconnaissance of Helsinki port facilities. Day 59, 21:37: USS Buffalo performed reconnaissance of Havana port facilities. Day 60, 01:12: Fire in the Fore Torpedo Room. Day 60, 03:36: USS Buffalo performed reconnaissance of Valparaíso port facilities. Day 60, 03:37: USS Buffalo performed reconnaissance of Valparaíso port facilities. Day 60, 09:54: Malfunction in No. 1 Turbine. Day 60, 09:54: Ship sunk: BAP Palacios (Peruvian Lupo Class Frigate). Day 60, 09:54: USS Buffalo successfully engaged enemy shipping near 35 N 54 W.
Day 60, 10:29: Fire suppression system malfunction in command centre. Day 60, 10:48: Patrol ended. Day 60, 10:55: Malfunction occured in Pressure Vessel of No. 1 Reactor. Day 60, 14:48: USS Buffalo performed reconnaissance of Kaliningrad port facilities. Day 60, 15:13: Ship sunk: SS Stockholm (Swedish Large Cargo Ship). Day 60, 16:09: Major fault detected in No. 1 Reactor coolant pump. Day 60, 16:52: Malfunction occured in Reactor Core of No. 1 Reactor. Day 60, 20:41: Ship sunk: SS Akizuki (Japanese Oil Tanker). Day 60, 20:41: USS Buffalo successfully engaged enemy shipping near 34 N 15 E.
Day 60, 20:52: Malfunction occured in Reactor Core of No. 1 Reactor. Day 60, 21:21: Patrol ended. Day 65, 03:36: Ship sunk: SS Makishio (Japanese Large Cargo Ship). Day 65, 03:36: USS Buffalo destroyed the important enemy vessel SS Makishio. Day 65, 06:24: Ventilation System failure in Torpedo Fuel Storage. Day 65, 08:26: Malfunction in No. 1 Turbine. Day 65, 08:38: USS Buffalo performed reconnaissance of Havana port facilities. Day 65, 16:20: USS Buffalo performed reconnaissance of Stanley port facilities. Day 66, 06:38: Ship sunk: SS Wonsan (North Korean Small Cargo Ship). Day 66, 06:38: USS Buffalo destroyed the important enemy vessel SS Wonsan. Day 66, 12:47: Ship sunk: SS Sincheonji (North Korean Large Cargo Ship). Day 66, 12:47: USS Buffalo destroyed the important enemy vessel SS Sincheonji. Day 66, 16:49: Ship sunk: ARC Mitú (Colombian Allen M. Summner Class Destroyer). Day 66, 16:49: USS Buffalo destroyed the important enemy vessel ARC Mitú. Day 66, 19 Fire suppression system malfunction in fore torpedo room. Day 66, 20:13: Malfunction in No. 2 Turbine. Day 66, 23:10: Patrol ended. Day 67, 04:29: Turbine generator malfunction. Day 67, 06:10: Turbine generator malfunction. Day 67, 10:20: USS Buffalo performed reconnaissance of Glasgow port facilities. Day 67, 15:50: Ship sunk: ARA Roca (Argentinian Allen M. Summner Class Destroyer). Day 67, 15:52: Patrol ended. Mission log of US submarine USS Buffalo. Under The Ice! Day 67, 18:21: Fire suppression system malfunction in generator room. Day 67, 21:20: USS Buffalo performed reconnaissance of Kaliningrad port facilities. Day 67, 21:52: Major fault detected in No. 1 Reactor coolant pump. Day 68, 03:20: USS Buffalo performed reconnaissance of Sevastopol port facilities. Day 68, 03:25: Turbine generator malfunction. Day 68, 03:25: Malfunction in No. 2 Turbine. Day 68, 05:51: Malfunction occured in Primary Coolant Pipes of No. 1 Reactor. Day 68, 23:23: USS Buffalo performed reconnaissance of Pyongyang port facilities. Day 69, 05:30: Malfunction occured in Primary Coolant Pipes of No. 1 Reactor. Day 69, 08:58: Lieutenant Joshua Johnson drowned. Day 69, 09:16: Seaman Evan Turner drowned. Day 69, 13:57: Ship sunk: SS Pijao (Colombian Small Cargo Ship). Day 69, 14:17: Malfunction in No. 1 Turbine. Day 69, 17:40: Fire suppression system malfunction in generator room. Day 69, 17:40: USS Buffalo docked at San Fransisco, USA for refit. Day 76, 17:40: USS Buffalo departed San Fransisco. Day 76, 17:44: Patrol ended. Mission log of US submarine USS Buffalo. RIP!! USS Buffalo Is On Eternal Patrol. Day 76, 18:43: Malfunction in No. 2 Turbine. Day 76, 18:44: Malfunction occured in Nuclear Fuel of No. 1 Reactor. Day 76, 18:44: Fire in the Fore Torpedo Room. Day 76, 19:52: Seaman Evan Turner drowned. Day 76, 19:52: Seaman Evan Kowalski drowned. Day 76, 19:54: Fire suppression system malfunction in command centre. Day 76, 20:24: failure in . Day 76, 20:32: USS Buffalo was fired on by BAP Palacios, a Peruvian Lupo Class Frigate. Day 76, 20:32: Chief Petty Officer Trevor Martínez was killed in an explosion. Day 76, 20:32: Seaman Alec McClane drowned. Day 76, 20:33: Ensign Bob Turner died from injuries. Day 76, 20:33: Chief Petty Officer Mason Steward drowned. Day 76, 20:34: Seaman Bruce McAllister drowned. Day 76, 20:34: Ensign Seth McClane drowned. Day 76, 20:34: Chief Petty Officer Hank Wilson drowned. Day 76, 20:34: Seaman Jesse González died from injuries. Day 76, 20:34: Seaman Bruce Turner drowned. Day 76, 20:35: Lieutenant Seth Alfonso drowned. Day 76, 20:35: Lieutenant Mason Calvert drowned. Day 76, 20:35: Chief Petty Officer Jon González drowned. Day 76, 20:35: Lieutenant Joshua Johnson drowned. Day 76, 20:35: Captain Clayton Calvert drowned. Day 76, 23:10: Patrol ended. Day 1, 11:59: USS Santa Fe performed reconnaissance of Caracas port facilities. Day 1, 12:31: Ship sunk: SS Qingfeng (Chinese Small Cargo Ship). Day 1, 15:47: Major fault detected in No. 1 Reactor coolant pump. Day 1, 16:22: Condenser failure in No. 1 Reactor Heat Exchanger. Day 1, 17:22: Malfunction in No. 1 Turbine. Day 2, 01:30: Ship sunk: José Alemán (Cuban Koni Class Frigate). Day 2, 02:42: Ship sunk: Camagüey (Cuban Koni Class Frigate). Day 2, 02:42: USS Santa Fe destroyed the important enemy vessel Camagüey. Day 2, 02:44: Ship sunk: MV (Cuban Small Cargo Ship). Day 2, 02:56: Fire suppression system malfunction in fore torpedo room. Day 2, 04:16: Patrol ended. Day 2, 05:39: USS Santa Fe performed reconnaissance of Caracas port facilities. Day 2, 13:00: Malfunction in No. 2 Turbine. Day 2, 15:09: Major fault detected in No. 1 Reactor coolant pump. Day 2, 15:11: Malfunction occured in Pressure Vessel of No. 1 Reactor. Day 2, 16:42: USS Santa Fe performed reconnaissance of Comodoro Rivadavia port facilities. Day 2, 19 Ship sunk: SS Almirante Irízar (Egyptian Small Cargo Ship). Day 2, 19 USS Santa Fe destroyed the important enemy vessel SS Almirante Irízar. Day 3, 05:21: USS Santa Fe performed reconnaissance of Havana port facilities. Day 3, 05:35: Ship sunk: MV Pyeongtaek (North Korean Oil Tanker). Day 3, 05:35: USS Santa Fe successfully engaged enemy shipping near 26 N 86 W.
Day 3, 08:20: Ship sunk: SS Okcheon (North Korean Large Cargo Ship). Day 3, 08:21: failure in . Day 3, 10:24: Major fault detected in No. 1 Reactor coolant pump. Day 3, 10:33: Ship sunk: SS Gyeongju (South Korean Large Cargo Ship). Day 3, 10:33: USS Santa Fe destroyed the important enemy vessel SS Gyeongju. Day 3, 11:38: Patrol ended.Mission log of US submarine USS Santa Fe. Day 3, 12:47: USS Santa Fe docked at Norfolk, USA for refit. Day 8, 12:47: USS Santa Fe departed Norfolk. Day 8, 15:25: Ship sunk: SS Guangzhou (Chinese Oil Tanker). Day 8, 15:40: Ship sunk: SS Putian (Chinese Large Cargo Ship). Day 8, 15:40: USS Santa Fe successfully engaged enemy shipping near 21 N 94 W.
Day 8, 15:40: Major fault detected in No. 1 Reactor coolant pump. Day 8, 19:35: Ship sunk: MV La Argentina (Iranian Small Cargo Ship). Day 8, 19:35: USS Santa Fe destroyed the important enemy vessel MV La Argentina. Day 8, 19:36: Patrol ended. Day 9, 05:11: CRT Display failure in Primary Turbine Control Panel. Day 9, 05:13: Turbine generator malfunction. Day 9, 05:17: Fire suppression system malfunction in command centre. Day 9, 05:18: Lieutenant Jesse Payne died from injuries. Day 9, 10:36: Ship sunk: SS Spiro (Libyan Oil Tanker). Day 9, 10:36: USS Santa Fe successfully engaged enemy shipping near 69 N 14 E.
Day 9, 12:21: Fire suppression system malfunction in engine room. Day 9, 12:30: Ship sunk: Tigre (Libyan Koni Class Frigate). Day 9, 12:30: Malfunction occured in Primary Coolant Pipes of No. 1 Reactor. Day 9, 12:30: Major fault detected in No. 1 Reactor coolant pump. Day 9, 12:39: Chief Petty Officer Isaac Macasek drowned. Day 9, 19:00: Patrol ended. Day 21, 12:47: Malfunction in No. 2 Turbine. Day 21, 19:18: Fire suppression system malfunction in command centre. Day 21, 19:19: USS Santa Fe performed reconnaissance of Marseille port facilities. Day 21, 21:42: Fire in the Fore Torpedo Room. Day 21, 21:43: Seaman Gregory Steele died from injuries. Day 21, 21:43: Chief Petty Officer Connor Anderson drowned. Day 21, 21:45: Seaman Bruce McCracken drowned. Day 21, 21:46: USS Santa Fe was fired on by ORP Kraków, a Polish Kashin Class Destroyer. Day 21, 21:46: Ship sunk: ORP Kraków (Polish Kashin Class Destroyer). Day 21, 21:46: USS Santa Fe successfully engaged enemy shipping near 42 N 22 W.
Day 21, 21:46: Chief Petty Officer Alec Martínez drowned. Day 22, 01:09: USS Santa Fe docked at Norfolk, USA for refit. Day 27, 01:09: USS Santa Fe departed Norfolk. Day 27, 01:11: Patrol ended at Norfolk, USA. Day 1, 08:00: Major fault detected in No. 1 Reactor coolant pump. Day 1, 09:29: Malfunction in No. 1 Turbine. Day 1, 09:30: Malfunction occured in Control Rods of No. 2 Reactor. Day 1, 10:46: Ship sunk: SS Zheng He (Chinese Small Cargo Ship). Day 1, 11:37: Malfunction occured in Control Rods of No. 1 Reactor. Day 1, 11:38: Ship sunk: MV Kuha (Finnish Oil Tanker). Day 1, 12:23: Fire in the Fore Torpedo Room. Day 1, 12:24: Seaman Ryan Reed drowned. Day 1, 13:52: USS Chicago docked at Mobile, USA for refit. Day 8, 13:52: USS Chicago departed Mobile. Day 8, 13:53: Patrol ended at Mobile, USA. Mission log of US submarine USS Chicago. Day 1, 05:50: Patrol started in Mobile, USA. Day 8, 20:47: Turbine generator malfunction. Day 8, 23:20: Ship sunk: Kola (Soviet Tarantul Class Corvette). Day 8, 23:21: Fire suppression system malfunction in command centre. Day 8, 23:36: Ship sunk: MV Independiente (Mexican Oil Tanker). Day 9, 03:15: USS Chicago was attacked with depth charges by IRIS Sarandí, a Iranian Allen M. Summner Class Destroyer. Day 9, 03:15: Ship sunk: IRIS Sarandí (Iranian Allen M. Summner Class Destroyer). Day 9, 04:18: USS Chicago docked at Norfolk, USA for refit. Day 15, 04:18: USS Chicago departed Norfolk. Day 15, 04:19: Patrol ended at Norfolk, USA. Day 1, 05:50: Patrol started in Los Angeles, USA. Day 1, 08:56: Ship sunk: Roca (Egyptian Koni Class Frigate). Day 1, 08:56: USS McKinley successfully engaged enemy shipping near 54 N 140 W.
Day 1, 11 Turbine generator malfunction. Day 1, 23:57: Reactor Core failure in No. 2 Reactor. Day 1, 23:58: Malfunction occured in Nuclear Fuel of No. 1 Reactor. Day 2, 01:38: Ship sunk: Comodoro Rivadavia (Egyptian Koni Class Frigate). Day 2, 01:38: USS McKinley successfully engaged enemy shipping near 74 N 12 E.
Day 2, 02:33: Fire suppression system malfunction in galley. Day 2, 07:09: Fire suppression system malfunction in command centre. Day 2, 07:11: Ensign Joseph Shoemaker drowned. Day 2, 07:12: Seaman Justin Meyer drowned. Day 2, 07:27: Seaman Alec McAllister died from injuries. Day 2, 07:37: USS McKinley docked at Belfast, United Kingdom for refit. Day 9, 07:37: USS McKinley departed Belfast. Day 9, 07:50: Patrol ended. Day 1, 05:50: Patrol started in New York, USA. Day 1, 08:38: Malfunction occured in Nuclear Fuel of No. 2 Reactor. Day 1, 08:43: USS Taylor performed reconnaissance of Caracas port facilities. Day 1, 10:47: Ship sunk: Zhanjiang (Chinese Luda Class Destroyer). Day 1, 10:47: Ship sunk: Wuhan (Chinese Luda Class Destroyer). Day 1, 10:47: USS Taylor destroyed the important enemy vessel Wuhan. Day 1, 10:48: Ship sunk: Hengshui (Chinese Luda Class Destroyer). Day 1, 11:50: Ship sunk: Kola (Soviet Sverdlov Class Cruiser). Day 1, 12:14: Ship sunk: Tambov (Soviet Koni Class Frigate). Day 1, 12:14: USS Taylor successfully engaged enemy shipping near 30 N 86 W.
Day 1, 12:34: USS Taylor docked at Tampa, USA for refit. Day 5, 12:34: USS Taylor departed Tampa. Day 5, 12:35: Patrol ended at Tampa, USA. Mission log of US submarine USS Taylor. Day 1, 05:50: Patrol started in Tampa, USA. Day 5, 18:01: Fire in the Fore Torpedo Room. Day 5, 18:23: Ship sunk: MV Airavat (Indian Small Cargo Ship). Day 5, 18:23: USS Taylor destroyed the important enemy vessel MV Airavat. Day 5, 21:21: Ventilation System failure in Torpedo Fuel Storage. Day 6, 00:29: Ship sunk: Rudecindo (Chilean Allen M. Summner Class Destroyer). Day 6, 00:29: USS Taylor successfully engaged enemy shipping near 65 S 48 W.
Day 6, 04:56: Patrol ended. Day 1, 05:50: Patrol started in Norfolk, USA.Mission log of US submarine USS Saratoga. Day 9, 02:04: Major fault detected in No. 1 Reactor coolant pump. Day 9, 05 Ship sunk: SS La Argentina (Libyan Oil Tanker). Day 9, 05 USS Saratoga destroyed the important enemy vessel SS La Argentina. Day 9, 08:45: Ensign William Nelson died of radiation poisoning. Day 9, 10:24: Ship sunk: IRIS La Argentina (Iranian Allen M. Summner Class Destroyer). Day 9, 10:24: USS Saratoga destroyed the important enemy vessel IRIS La Argentina. Day 9, 12:39: Impeller failure in Bilge Pump. Day 9, 12:40: Seaman Bob Jacobson was killed in an explosion. Day 9, 12:41: Seaman Dylan Charlebois died from injuries. Day 9, 13:31: Lieutenant Jesse Brooks drowned. Day 9, 17:29: USS Saratoga docked at Tampa, USA for refit. Day 13, 17:29: USS Saratoga departed Tampa. Day 13, 17:30: Patrol ended at Tampa, USA. Day 1, 06:49: Major fault detected in No. 1 Reactor coolant pump. Day 1, 09:27: Seaman Bob Jacobson died of radiation poisoning. Day 1, 11:51: Major fault detected in No. 1 Reactor coolant pump. Day 1, 11:51: Ship sunk: Nerpal (Soviet Tarantul Class Corvette). Day 1, 11:51: Ship sunk: Kuznetsov (Soviet Victor III Class Attack Submarine). Day 1, 11:51: Ship sunk: Zelenograd (Soviet Koni Class Frigate). Day 1, 12:13: Major fault detected in No. 1 Reactor coolant pump. Day 1, 12:16: Seaman Cameron González died of radiation poisoning. Day 1, 12:18: Ensign William Nelson died of radiation poisoning. Day 1, 12:32: Major fault detected in No. 1 Reactor coolant pump. Day 1, 12:44: Seaman Dylan Charlebois died of radiation poisoning. Day 1, 12:50: Ship sunk: Leopard (Soviet Koni Class Frigate). Day 1, 12:50: USS Saratoga engaged a Soviet battlegroup, sinking the important enemy vessel Leopard. Day 1, 12:51: Turbine generator malfunction. Day 1, 17:28: Ship sunk: MV Indómita (Libyan Small Cargo Ship). Day 1, 17:28: USS Saratoga destroyed the important enemy vessel MV Indómita. Day 1, 20:17: Malfunction in No. 2 Turbine. Day 1, 20:20: Malfunction occured in Reactor Core of No. 1 Reactor. Day 1, 21:32: USS Saratoga docked at Honolulu, USA for refit. Day 8, 21:32: USS Saratoga departed Honolulu. Day 8, 21:33: Patrol ended at Honolulu, USA. Mission log of US submarine USS Saratoga. Day 13, 17:39: Malfunction in No. 1 Turbine. Day 13, 19:50: USS Saratoga performed reconnaissance of Cartegena port facilities. Day 13, 20:50: Ship sunk: IRIS Julio Krause (Iranian Allen M. Summner Class Destroyer). Day 13, 20:50: USS Saratoga successfully engaged enemy shipping near 20 N 76 W.
Day 14, 01:07: Fire suppression system malfunction in fore torpedo room. Day 14, 01:07: Lieutenant Derek Underwood died of asphyxiation. Day 14, 01:13: Seaman Dylan Charlebois died of asphyxiation. Day 14, 03:17: Ensign William Nelson died from injuries. Day 14, 06:19: USS Saratoga was fired on by Arkhangelsk, a Soviet Koni Class Frigate. Day 14, 06:19: USS Saratoga was fired on by Kashalot, a Soviet Kashin Class Destroyer. Day 14, 06:19: USS Saratoga was fired on by Gepard, a Soviet Koni Class Frigate. Day 14, 06:19: USS Saratoga was fired on by Moksha, a Soviet Koni Class Frigate. Day 14, 06:19: USS Saratoga was fired on by Samara, a Soviet Sverdlov Class Cruiser. Day 14, 06:19: USS Saratoga was fired on by Tula, a Soviet Tarantul Class Corvette. Day 14, 06:19: Ensign Evan McCarthy drowned. Day 14, 06:19: Patrol ended. Day 1, 07:16: Malfunction occured in Reactor Core of No. 1 Reactor. Day 1, 08:07: Ship sunk: Máximo Gómez (Cuban Koni Class Frigate). Day 1, 08:08: Fire suppression system malfunction in fore torpedo room. Day 1, 11:26: Seaman Walter McEnroe died of radiation poisoning. Day 1, 11:32: Ship sunk: Delfin (Soviet Victor III Class Attack Submarine). Day 1, 11:32: Ship sunk: Pavlovsk (Soviet Koni Class Frigate). Day 1, 11:32: Ship sunk: Katerina (Soviet Victor III Class Attack Submarine). Day 1, 11:32: Malfunction in No. 2 Turbine. Day 1, 12:02: Ship sunk: Petrozavodsk (Soviet Tarantul Class Corvette). Day 1, 12:02: USS Buffalo engaged a Soviet battlegroup, sinking the important enemy vessel Petrozavodsk. Day 1, 12:02: Malfunction occured in Nuclear Fuel of No. 1 Reactor. Day 1, 18:21: USS Buffalo docked at Norfolk, USA for refit. Day 5, 18:21: USS Buffalo departed Norfolk. Day 5, 18:22: Patrol ended at Norfolk, USA. Day 5, 23:08: Ship sunk: Rhine (East German Tarantul Class Corvette). Day 6, 00:45: Malfunction occured in Reactor Core of No. 1 Reactor. Day 6, 00:46: Turbine generator malfunction. Day 6, 00:52: Malfunction in No. 1 Turbine. Day 6, 01:11: Malfunction in No. 1 Turbine. Day 6, 01:35: Ship sunk: SS Jiangzhen (Chinese Large Cargo Ship). Day 6, 01:35: USS Buffalo destroyed the important enemy vessel SS Jiangzhen. Day 6, 05:19: Electric Motor failure in Bilge Pump. Day 6, 05:19: Seaman Eric Garcia died of radiation poisoning. Day 6, 05:23: Ship sunk: SS Álvaro de Bazán (Spanish Large Cargo Ship). Day 6, 05:23: Fire suppression system malfunction in generator room. Day 6, 05:24: Ship sunk: MV Heroína (Egyptian Small Cargo Ship). Day 6, 05:28: CRT Display failure in Power Systems Control Panel. Day 6, 05:28: Ship sunk: Roca (Egyptian Koni Class Frigate). Day 6, 05:28: USS Buffalo successfully engaged enemy shipping near 39 N 15 E.
Day 6, 06:04: USS Buffalo performed reconnaissance of Tripoli port facilities. Day 6, 17:00: USS Buffalo docked at Norfolk, USA for refit. Day 13, 17:00: USS Buffalo departed Norfolk. Day 13, 17:00: Patrol ended at Norfolk, USA. Day 1, 05:57: Patrol ended. Mission log of US submarine USS Jacksonville. Day 1, 07:46: Malfunction occured in Control Rods of No. 1 Reactor. Day 1, 08:23: Ship sunk: Cuéllar (Cuban Koni Class Frigate). Day 1, 08:24: Ship sunk: MV Raul Castro (Cuban Small Cargo Ship). Day 1, 08:26: USS Jacksonville successfully engaged enemy shipping near 20 N 87 W.
Day 1, 08:28: Ship sunk: MV Rio Anaya (Cuban Small Cargo Ship). Day 1, 10:27: USS Jacksonville was fired on by Severstal, a Soviet Victor III Class Attack Submarine. Day 1, 10:27: USS Jacksonville was fired on by Katyusha, a Soviet Victor III Class Attack Submarine. Day 1, 10:27: USS Jacksonville was fired on by Tver, a Soviet Victor III Class Attack Submarine. Day 1, 10:27: USS Jacksonville was fired on by Ekaterinburg, a Soviet Victor III Class Attack Submarine. Day 1, 10:27: Ship sunk: Tver (Soviet Victor III Class Attack Submarine). Day 1, 10:27: Ship sunk: Irkutsk (Soviet Koni Class Frigate). Day 1, 10:27: Ship sunk: Ekaterinburg (Soviet Victor III Class Attack Submarine). Day 1, 10:27: Ship sunk: Tula (Soviet Kashin Class Destroyer). Day 1, 10:28: USS Jacksonville was attacked with depth charges by Moksha, a Soviet Kashin Class Destroyer. Day 1, 10:28: Seaman Albert Goode drowned. Day 1, 10:28: Chief Petty Officer Mason Manley drowned. Day 1, 10:29: Lieutenant Nathan Adams drowned. Day 1, 10:29: Lieutenant Alexander Brooks drowned. Day 1, 10:29: Lieutenant Perry Ming drowned. Day 1, 10:29: Captain Benjamin Shields drowned. Day 1, 10:29: Patrol ended. Day 1, 22:49: Turbine generator malfunction. Day 1, 23:43: Ship sunk: Tigre (Libyan Koni Class Frigate). Day 2, 03:10: USS Philadelphia performed reconnaissance of Havana port facilities. Day 2, 08:34: Turbine generator malfunction. Day 2, 08:40: Malfunction in No. 1 Turbine. Day 2, 08:41: Malfunction occured in Control Rods of No. 1 Reactor. Day 2, 11:39: Ship sunk: Tigre (Libyan Koni Class Frigate). Day 2, 11:39: USS Philadelphia destroyed the important enemy vessel Tigre. Day 2, 11:49: Fire suppression system malfunction in generator room. Day 2, 13:51: Fire suppression system malfunction in generator room. Day 2, 18:32: Fire suppression system malfunction in command centre. Day 2, 22:01: Turbine generator malfunction. Day 2, 22:01: Ship sunk: Hércules (Egyptian Koni Class Frigate). Day 2, 22:01: USS Philadelphia destroyed the important enemy vessel Hércules. Day 2, 23:21: Ship sunk: SS Tornado (Spanish Oil Tanker). Day 2, 23:21: USS Philadelphia destroyed the important enemy vessel SS Tornado. Day 3, 01:31: Fire suppression system malfunction in command centre. Day 3, 01:40: USS Philadelphia docked at Honolulu, USA for refit. Day 8, 01:40: USS Philadelphia departed Honolulu. Day 8, 01:40: Patrol ended at Honolulu, USA. Mission log of US submarine USS Philadelphia. Day 8, 06:44: Ship sunk: SS Tabarca (Spanish Oil Tanker). Day 8, 10:18: Malfunction in No. 2 Turbine. Day 8, 10:56: Ship sunk: MV Hunze (Dutch Small Cargo Ship). Day 8, 10:56: USS Philadelphia successfully engaged enemy shipping near 23 N 95 W.
Day 8, 13 USS Philadelphia performed reconnaissance of Havana port facilities. Day 8, 14:25: Malfunction in No. 2 Turbine. Day 8, 14:28: Malfunction in No. 1 Turbine. Day 8, 16:12: Major fault detected in No. 2 Reactor coolant pump. Day 8, 19:41: USS Philadelphia performed reconnaissance of Valparaíso port facilities. Day 8, 20:08: Patrol ended. Day 9, 00:32: USS Philadelphia performed reconnaissance of Caracas port facilities. Day 9, 01:41: USS Philadelphia performed reconnaissance of Cartegena port facilities. Day 9, 04:26: Fire suppression system malfunction in engine room. Day 9, 06:54: Malfunction in No. 1 Turbine. Day 9, 09:20: Ship sunk: Braunschweig (East German Koni Class Frigate). Day 9, 09:20: USS Philadelphia successfully engaged enemy shipping near 24 N 70 W.
Day 9, 14:37: Fire suppression system malfunction in engine room. Day 9, 14:38: Malfunction occured in Reactor Core of No. 2 Reactor. Day 9, 19:30: USS Philadelphia docked at Norfolk, USA for refit. Day 15, 19:30: USS Philadelphia departed Norfolk. Day 15, 19:31: Patrol ended at Norfolk, USA. Day 15, 21:20: USS Philadelphia performed reconnaissance of Halifax port facilities. Day 15, 23:37: Ship sunk: MV Evertsen (Dutch Small Cargo Ship). Day 16, 03:44: Ship sunk: HNLMS Provinciën (Dutch Kortenaer Class Frigate). Day 16, 03:44: USS Philadelphia successfully engaged enemy shipping near 75 N 9 W.
Day 16, 03:51: Ship sunk: Patagonia (Libyan Koni Class Frigate). Day 16, 03:51: USS Philadelphia destroyed the important enemy vessel Patagonia. Day 16, 06:08: USS Philadelphia performed reconnaissance of Belfast port facilities. Day 16, 06:30: Malfunction occured in Pressure Vessel of No. 2 Reactor. Day 16, 11:18: Malfunction in No. 2 Turbine. Day 16, 11:24: Ship sunk: Yekuana (Venezuelan Allen M. Summner Class Destroyer). Day 16, 11:24: USS Philadelphia destroyed the important enemy vessel Yekuana. Day 16, 12:21: Major fault detected in No. 1 Reactor coolant pump. Day 16, 12:45: Fire suppression system malfunction in command centre. Day 16, 14:22: Internal Circuits failure in Maneuver Control Panel. Day 16, 15:18: USS Philadelphia docked at Norfolk, USA for refit. Day 23, 15:18: USS Philadelphia departed Norfolk. Day 23, 15:19: Patrol ended. Day 1, 13:16: Malfunction occured in Nuclear Fuel of No. 1 Reactor. Day 1, 13:27: Ship sunk: Tunguska (Soviet Koni Class Frigate). Day 1, 13:27: Ship sunk: Rys (Soviet Kashin Class Destroyer). Day 1, 13:27: Ship sunk: Tula (Soviet Sverdlov Class Cruiser). Day 1, 13:27: Ship sunk: Novomoskovsk (Soviet Koni Class Frigate). Day 1, 13:27: USS Scranton destroyed the important enemy vessel Novomoskovsk. Day 1, 13:27: USS Scranton was fired on by Kashalot, a Soviet Victor III Class Attack Submarine. Day 1, 13:29: Chief Petty Officer Jacob Macasek drowned. Day 1, 13:31: Lieutenant James McEnroe drowned. Day 1, 13:36: Lieutenant Cameron Miller drowned. Day 1, 15:07: Major fault detected in No. 1 Reactor coolant pump. Day 1, 16:21: USS Scranton docked at Los Angeles, USA for refit. Day 7, 16:21: USS Scranton departed Los Angeles. Day 7, 16:22: Patrol ended at Los Angeles, USA. Mission log of US submarine USS Scranton. Day 7, 16:23: Fire in the Fore Torpedo Room. Day 7, 16:24: Seaman Dominic González was killed in an explosion. Day 7, 16:24: Seaman Devon Hoffman drowned. Day 7, 16:24: Malfunction occured in Reactor Core of No. 2 Reactor. Day 7, 16:27: Turbine generator malfunction. Day 7, 16:27: Major fault detected in No. 1 Reactor coolant pump. Day 7, 16:47: USS Scranton docked at Los Angeles, USA for refit. Day 13, 16:47: USS Scranton departed Los Angeles. Day 13, 16:53: Patrol ended. Day 1, 05:59: Malfunction occured in Primary Coolant Pipes of No. 2 Reactor. Day 1, 06:42: Patrol ended. Day 1, 05:51: Patrol ended at Norfolk, USA. Mission log of US submarine USS Hewitt. Day 1, 12:50: Ship sunk: Pavlovsk (Soviet Kashin Class Destroyer). Day 1, 12:50: Ship sunk: Pantera (Soviet Victor III Class Attack Submarine). Day 1, 12:50: Ship sunk: Zumashedsniy (Soviet Kashin Class Destroyer). Day 1, 12:50: Ship sunk: Verkhoturye (Soviet Tarantul Class Corvette). Day 1, 12:50: Ship sunk: Smolensk (Soviet Koni Class Frigate). Day 1, 12:51: Ship sunk: Verkhoturye (Soviet Tarantul Class Corvette). Day 1, 16 USS Hewitt docked at Belfast, United Kingdom for refit. Day 8, 16 USS Hewitt departed Belfast. Day 8, 16:08: Patrol ended. Day 8, 22:10: USS Hewitt performed reconnaissance of Caracas port facilities. Day 9, 06:42: USS Hewitt performed reconnaissance of Vancouver port facilities. Day 9, 07:41: Patrol ended. 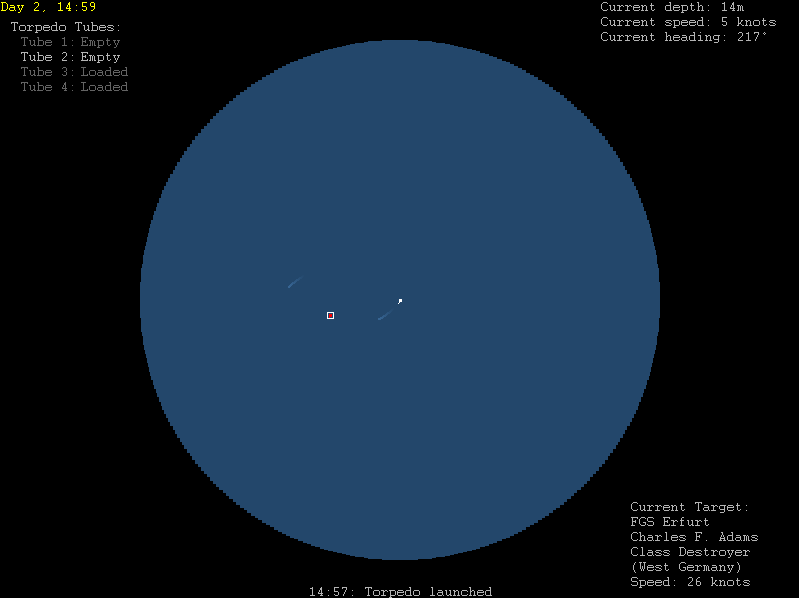 Day 1, 08:38: USS Farragut performed reconnaissance of Caracas port facilities. Day 1, 11:05: Ship sunk: Donskoy (Soviet Sverdlov Class Cruiser). Day 1, 11:09: Ship sunk: Donskoy (Soviet Sverdlov Class Cruiser). Day 1, 12:19: Major fault detected in No. 1 Reactor coolant pump. Day 1, 12:23: Ensign Cooper Irwin died of radiation poisoning. Day 1, 13:45: Malfunction in No. 1 Turbine. Day 1, 14:50: Patrol ended. Mission log of US submarine USS Farragut. Day 1, 19:21: Ship sunk: SS Drummond (Iranian Small Cargo Ship). Day 1, 19:28: Ship sunk: IRIS Patagonia (Iranian Allen M. Summner Class Destroyer). Day 1, 19:40: Fire suppression system malfunction in engine room. Day 1, 19:43: Ship sunk: SS Spiro (Iranian Oil Tanker). Day 1, 19:43: USS Farragut successfully engaged enemy shipping near 60 N 10 W.
Day 2, 01:41: USS Farragut docked at Norfolk, USA for refit. Day 8, 01:41: USS Farragut departed Norfolk. Day 8, 01:42: Patrol ended at Norfolk, USA. Day 1, 05:50: Patrol started in Stanley, United Kingdom. Day 5, 07:40: Malfunction in No. 1 Turbine. Day 5, 07:45: Ventilation System failure in Torpedo Fuel Storage. Day 5, 11:56: Fire suppression system malfunction in engine room. Day 5, 14:49: HMS Albion was fired on by Kuznikov, a Soviet Victor III Class Attack Submarine. Day 5, 14:49: Ship sunk: Nerpal (Soviet Tarantul Class Corvette). Day 5, 15:55: HMS Albion docked at Halifax, Canada for refit. Day 10, 15:55: HMS Albion departed Halifax. Day 10, 15:57: Patrol ended at Halifax, Canada. Day 10, 16:56: Fire suppression system malfunction in equipment storage. Day 10, 17:11: Impeller failure in Bilge Pump. Day 10, 20:39: Major fault detected in No. 1 Reactor coolant pump. Day 10, 20:42: Major fault detected in No. 1 Reactor coolant pump. Day 10, 22:22: Ensign Caleb Cranford drowned. Day 10, 22:44: Major fault detected in No. 1 Reactor coolant pump. Day 10, 22:59: HMS Albion docked at Devonport, United Kingdom for refit. Day 15, 22:59: HMS Albion departed Devonport. Day 15, 22:59: Patrol ended at Devonport, United Kingdom. Mission log of British submarine HMS Albion. Day 1, 05:50: Patrol started in Devonport, United Kingdom. Day 15, 23:22: Malfunction occured in Reactor Core of No. 2 Reactor. Day 16, 05:41: Ship sunk: SS San Juan (Libyan Large Cargo Ship). Day 16, 08:11: Patrol ended. Day 16, 12:21: HMS Albion performed reconnaissance of Kaliningrad port facilities. Day 16, 22:57: Malfunction occured in Nuclear Fuel of No. 2 Reactor. Day 17, 02:08: Fire in the Fore Torpedo Room. Day 17, 02:13: Chief Petty Officer Cade Marsh was killed in an explosion. Day 17, 02:13: Seaman Charles Lawson was killed in an explosion. Day 17, 02:13: Seaman Thomas Arlington drowned. Day 17, 02:37: HMS Albion performed reconnaissance of Capetown port facilities. Day 17, 08:28: HMS Albion docked at Stanley, United Kingdom for refit. Day 22, 08:28: HMS Albion departed Stanley. Day 22, 08:30: Patrol ended at Stanley, United Kingdom. Day 22, 11:16: Fire suppression system malfunction in fore torpedo room. Day 22, 11:17: Fire suppression system malfunction in generator room. Day 22, 11:17: Chief Petty Officer Cade Marsh died from injuries. Day 22, 11:18: Seaman Thomas Arlington died from injuries. Day 22, 13:21: Patrol ended. Day 1, 05:59: Patrol ended. Day 1, 08 HMS Iron Duke performed reconnaissance of Florianopolis port facilities. Day 1, 08 Major fault detected in No. 2 Reactor coolant pump. Day 1, 08:44: Ship sunk: ARA Castillo (Argentinian Allen M. Summner Class Destroyer). Day 1, 08:45: Ship sunk: SS La Argentina (Argentinian Small Cargo Ship). Day 1, 08:45: HMS Iron Duke successfully engaged enemy shipping near 35 S 44 W.
Day 1, 09:50: Fire suppression system malfunction in engine room. Day 1, 10:08: Ship sunk: SS Roca (Iranian Oil Tanker). Day 1, 11:04: Ship sunk: MV (Cuban Large Cargo Ship). Day 1, 13:05: Malfunction occured in Pressure Vessel of No. 2 Reactor. Day 1, 15:14: Ship sunk: IRIS Drummond (Iranian Allen M. Summner Class Destroyer). Day 1, 15:14: HMS Iron Duke destroyed the important enemy vessel IRIS Drummond. Day 1, 17:38: Major fault detected in No. 1 Reactor coolant pump. Day 1, 18:09: Patrol ended. Day 1, 05:50: Patrol started in Tel Aviv, Israel. Mission log of Israeli submarine INS Haifa. Day 1, 11:56: Fire in the Fore Torpedo Room. Day 1, 11:59: Major fault detected in No. 1 Reactor coolant pump. Day 1, 12:45: Ensign Yair Netanyahu drowned. Day 1, 12:55: INS Haifa docked at Belfast, United Kingdom for refit. Day 5, 12:55: INS Haifa departed Belfast. Day 5, 12:59: Patrol ended. Day 5, 19:58: INS Haifa was fired on by Verkhoturye, a Soviet Victor III Class Attack Submarine. Day 5, 19:58: INS Haifa was fired on by Belgorod, a Soviet Victor III Class Attack Submarine. Day 5, 19:58: Ship sunk: Verkhoturye (Soviet Victor III Class Attack Submarine). Day 5, 19:58: Seaman Gedaliah Ish-Shalom was killed in an explosion. Day 5, 19:58: Ship sunk: Belgorod (Soviet Victor III Class Attack Submarine). Day 5, 19:58: Fire in the Fore Torpedo Room. Day 5, 19:59: Seaman Gidon Malmuth drowned. Day 5, 19:59: Seaman Itai Shapiro drowned. Day 5, 19:59: Ensign Yair Netanyahu died from injuries. Day 5, 20:00: Chief Petty Officer Yitzhak Malmuth drowned. Day 5, 20:00: Chief Petty Officer Netanel Ben-Ari drowned. Day 5, 20:00: Seaman Avi Akhiezer drowned. Day 5, 20:20: Lieutenant Ben-Zion Banai drowned. Mission log of Israeli submarine INS Jerusalem. Day 1, 05:59: Major fault detected in No. 1 Reactor coolant pump. Day 1, 05:56: Fire in the Fore Torpedo Room. Day 1, 06 USS Hampton docked at Norfolk, USA for refit. Day 7, 06 USS Hampton departed Norfolk. Day 7, 06:14: Patrol ended. Day 1, 06:01: Patrol Mission log of US submarine USS Providence. Day 1, 08:09: USS Providence was fired on by Bryansk, a Soviet Victor III Class Attack Submarine. Day 1, 08:09: USS Providence was fired on by Simbirsk, a Soviet Victor III Class Attack Submarine. Day 1, 08:09: USS Providence was attacked with depth charges by Kamchatskiy, a Soviet Koni Class Frigate. Day 1, 08:10: USS Providence destroyed the important enemy vessel Kamchatskiy. Day 1, 08:11: Lieutenant Seth Ortega drowned. Day 1, 08:11: Captain Lucas Macasek died from injuries. Day 1, 08:11: Lieutenant Peyton Meyer drowned. Day 1, 05:55: Patrol ended. Mission log of US submarine USS Albuquerque. Day 1, 06:58: USS Albuquerque was attacked with depth charges by , a Cuban Koni Class Frigate. Day 1, 07:14: USS Albuquerque docked at Tampa, USA for refit. Day 7, 07:14: USS Albuquerque departed Tampa. Day 7, 07:15: Patrol ended at Tampa, USA. Day 1, 16:23: USS Portsmouth performed reconnaissance of Comodoro Rivadavia port facilities. Day 1, 17:25: Malfunction occured in Primary Coolant Pipes of No. 1 Reactor. Day 1, 21:52: Major fault detected in No. 1 Reactor coolant pump. Day 1, 21:56: Seaman Evan Young drowned. Day 1, 21:57: Ensign Clayton McCarthy drowned. Day 1, 21:58: Ensign Edward Manley drowned. Day 1, 22:08: Seaman Michael Schwartz drowned. Day 1, 22:54: Nuclear meltdown in No. 1 reactor. Day 2, 02:58: USS Portsmouth was fired on by Hansa, a East German Tarantul Class Corvette. Day 2, 02:59: Ship sunk: Hansa (East German Tarantul Class Corvette). Day 2, 03:14: Seaman James Meyer was killed in an explosion. Day 2, 03:35: Seaman Jesse Carter drowned. Day 2, 03:40: Seaman Nicholas Yoder drowned. Day 2, 03:49: Chief Petty Officer Jared Hoffman drowned. Day 2, 03:50: Chief Petty Officer John Wilson drowned. Day 2, 03:55: Seaman Jordan Calvert drowned. Day 2, 04:28: Patrol ended. Day 1, 06:30: Fire suppression system malfunction in command centre. Day 1, 06:30: Ensign James Irwin died from injuries. Day 1, 11:31: Turbine generator malfunction. Day 1, 11:33: USS Cleveland performed reconnaissance of Malmö port facilities. Day 1, 11:48: USS Cleveland was fired on by Volk, a Soviet Victor III Class Attack Submarine. Day 1, 11:48: USS Cleveland was fired on by Katyusha, a Soviet Koni Class Frigate. Day 1, 11:48: USS Cleveland was fired on by Verkhoturye, a Soviet Koni Class Frigate. Day 1, 11:48: USS Cleveland was fired on by Smolensk, a Soviet Kashin Class Destroyer. Day 1, 11:48: USS Cleveland was fired on by Simbirsk, a Soviet Sverdlov Class Cruiser. Day 1, 11:48: USS Cleveland was fired on by Tunguska, a Soviet Sverdlov Class Cruiser. Day 1, 11:48: USS Cleveland was fired on by Podolsk, a Soviet Tarantul Class Corvette. Day 1, 11:48: USS Cleveland was fired on by Kirensk, a Soviet Sverdlov Class Cruiser. Day 1, 11:48: Seaman Alexander Bauer was killed in an explosion. Day 1, 11:48: USS Cleveland was fired on by Akula, a Soviet Sverdlov Class Cruiser. Day 1, 11:48: USS Cleveland was fired on by Pantera, a Soviet Tarantul Class Corvette. Day 1, 11:49: Ensign Andrew Yoder drowned. Day 1, 11:49: Seaman Brian Payne died from injuries. Day 1, 11:50: Chief Petty Officer Spencer Wright drowned. Day 1, 11:50: Seaman Jared Shoemaker died from injuries. Day 1, 11:50: Seaman Nicholas Thompson drowned. Day 1, 11:50: Chief Petty Officer Peter Charlebois drowned. Day 1, 11:50: Seaman Bruce Garcia drowned. Day 1, 11:50: Chief Petty Officer Spencer Evans drowned. Day 1, 11:50: Seaman Quentin Manley drowned. Day 1, 11:50: Patrol ended. Day 1, 11:19: Speed Governor failure in Diesel Generator No. 1. Day 1, 11:20: Ship sunk: Yelna (Soviet Tarantul Class Corvette). Day 1, 11:20: USS destroyed the important enemy vessel Yelna. Day 1, 11:49: Malfunction occured in Primary Coolant Pipes of No. 1 Reactor. Day 1, 19:17: USS was attacked with depth charges by Gepard, a Soviet Koni Class Frigate. Day 1, 19:17: Ship sunk: Donskoy (Soviet Koni Class Frigate). Day 1, 19:17: USS was attacked with depth charges by Nerpal, a Soviet Koni Class Frigate. Day 1, 19:17: USS was attacked with depth charges by Yegorlik, a Soviet Koni Class Frigate. Day 1, 19:17: Ship sunk: Kamchatskiy (Soviet Tarantul Class Corvette). Day 1, 19:17: USS engaged a Soviet battlegroup, sinking the important enemy vessel Kamchatskiy. Day 1, 19:18: Captain Joshua Kowalski drowned. Day 1, 19:18: Chief Petty Officer John Hazell drowned. Day 1, 19:18: Seaman Walter McCracken drowned. Day 1, 19:19: Seaman Kevin Cain drowned. Day 1, 19:35: Seaman Christopher McClane died from injuries. Day 1, 19:37: Seaman Devon Schmidt died from injuries. Day 1, 19:42: Chief Petty Officer Patrick Garcia drowned. Day 1, 19:45: Ensign Isaac Ming drowned. Day 1, 19:53: Patrol ended. Day 1, 13:12: Fire in the Fore Torpedo Room. Day 1, 14:29: USS performed reconnaissance of Caracas port facilities. Day 1, 15:31: Patrol ended. Day 1, 21:45: USS performed reconnaissance of Capetown port facilities. Day 1, 21:51: Malfunction occured in Pressure Vessel of No. 2 Reactor. Day 1, 22:39: Ship sunk: Yelna (Soviet Victor III Class Attack Submarine). Day 1, 22:39: USS was fired on by Kugar, a Soviet Victor III Class Attack Submarine. Day 1, 22:39: USS was fired on by Tunguska, a Soviet Victor III Class Attack Submarine. Day 1, 22:39: USS was fired on by Chelyabinsk, a Soviet Victor III Class Attack Submarine. Day 1, 22:39: Ship sunk: Chelyabinsk (Soviet Victor III Class Attack Submarine). Day 1, 22:39: USS was fired on by Severstal, a Soviet Victor III Class Attack Submarine. Day 1, 22:39: USS was fired on by Yegorlik, a Soviet Victor III Class Attack Submarine. Day 1, 22:39: Ship sunk: Kugar (Soviet Victor III Class Attack Submarine). Day 1, 22:39: Seaman Kevin McEnroe was killed in an explosion. Day 1, 22:39: Ship sunk: Yegorlik (Soviet Victor III Class Attack Submarine). Day 1, 22:40: Chief Petty Officer Alexander Taylor drowned. Day 1, 22:50: Seaman Bob Oliver drowned. Day 1, 22:51: Chief Petty Officer Jacob Oliver drowned. Day 1, 22:51: Ensign Devon Steele was crushed by water pressure. Day 1, 22:51: Ensign Jesse Brown drowned. Day 1, 22:51: Seaman Brody Thompson drowned. Day 1, 22:51: Seaman Isaac Yoder died from injuries. Day 1, 22:51: Captain William Evans drowned. Day 1, 22:52: Lieutenant Walter Mills died from injuries. Day 1, 22:52: Lieutenant Spencer McClane drowned. Day 2, 00:00: Lieutenant Jared Schwartz drowned. Day 2, 00:42: Chief Petty Officer Miles Hostetler drowned. Day 2, 00:56: Seaman Derek Miller drowned. Day 2, 01:46: Seaman Jason Carter drowned. Day 2, 01:49: Patrol ended. Day 1, 12 Fire in the Fore Torpedo Room. Day 1, 12:07: Seaman Jeffrey White was killed in an explosion. Day 1, 12:07: Chief Petty Officer Evan Lee drowned. Day 1, 12:07: Seaman Peter Jackson drowned. 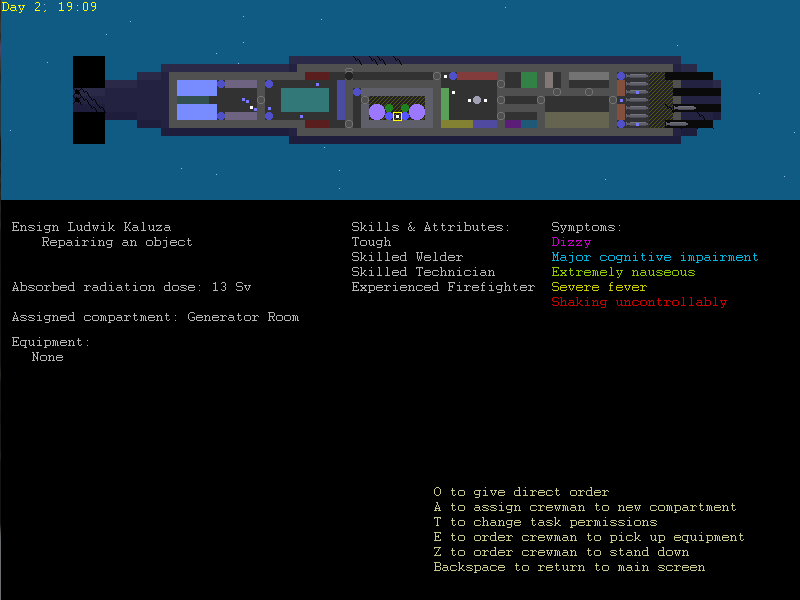 Day 1, 12:07: Ventilation System failure in Torpedo Fuel Storage. Day 1, 12:08: Malfunction in No. 1 Turbine. Day 1, 13:59: Fire suppression system malfunction in engine room. Day 1, 15:37: USS Alexandria docked at Tampa, USA for refit. Day 8, 15:37: USS Alexandria departed Tampa. Day 8, 15:42: Patrol ended. Day 8, 17:12: USS Alexandria successfully engaged enemy shipping near 21 N 66 W.
Day 8, 19:05: Ship sunk: SS Hancza (Polish Oil Tanker). Day 8, 19:05: USS Alexandria destroyed the important enemy vessel SS Hancza. Day 8, 21:20: USS Alexandria was fired on by Kuznetsov, a Soviet Victor III Class Attack Submarine. Day 8, 21:20: USS Alexandria was attacked with depth charges by Volk, a Soviet Koni Class Frigate. Day 8, 21:20: USS Alexandria was attacked with depth charges by Smolensk, a Soviet Koni Class Frigate. Day 8, 21:20: USS Alexandria was attacked with depth charges by Yegorlik, a Soviet Koni Class Frigate. Day 8, 21:50: Major fault detected in No. 2 Reactor coolant pump. Day 8, 22:11: Lieutenant Isaiah Walton drowned. Day 8, 22:16: Lieutenant Jon Steele drowned. Day 8, 22:24: Captain Richard Tracy drowned. Day 8, 22:28: Lieutenant Hank Lee drowned. Day 8, 22:29: Seaman Jeffrey White was crushed by water pressure. Day 8, 22:29: Chief Petty Officer Evan Lee drowned. Day 8, 22:29: Ensign Samuel Grant died from injuries. Day 8, 22:29: Patrol ended. Day 1, 15:26: HMS Titan performed reconnaissance of Florianopolis port facilities. Day 1, 15:52: Patrol ended. Mission log of British submarine HMS Titan. Day 1, 19:33: Ship sunk: SS Yelna (Soviet Oil Tanker). Day 1, 22:42: HMS Titan performed reconnaissance of Valparaíso port facilities. Day 1, 23:14: Ship sunk: Iribis (Soviet Kashin Class Destroyer). Day 1, 23:15: Ship sunk: Leopard (Soviet Kashin Class Destroyer). Day 1, 23:15: HMS Titan destroyed the important enemy vessel Leopard. Day 1, 23:16: Major fault detected in No. 2 Reactor coolant pump. Day 1, 23:47: Electric Motor failure in Bilge Pump. Day 1, 23:47: Fire suppression system malfunction in command centre. Day 1, 23:47: Malfunction occured in Control Rods of No. 2 Reactor. Day 1, 23:48: Ensign Stephen Abbett died of asphyxiation. Day 2, 00:24: Patrol ended. Day 2, 03:35: Malfunction in No. 1 Turbine. Day 2, 03:38: Nuclear Fuel failure in No. 2 Reactor. Day 2, 04:17: HMS Titan was attacked by a Argentinian P-3 Orion. Day 2, 04:17: Ship sunk: ARA Almirante Brown (Argentinian Allen M. Summner Class Destroyer). Day 2, 04:18: Electric Motor failure in Bilge Pump. Day 2, 05:18: Patrol ended. Day 2, 09:56: Turbine generator malfunction. Day 2, 11:47: Ship sunk: SS Roca (Egyptian Large Cargo Ship). Day 2, 11:47: HMS Titan destroyed the important enemy vessel SS Roca. Day 2, 11:53: Patrol ended. Day 3, 00:12: Internal Circuits failure in Power Systems Control Panel. Day 3, 01:05: Major fault detected in No. 1 Reactor coolant pump. Day 3, 05:36: Impeller failure in Bilge Pump. Day 3, 05:36: Governor failure in Turbine Generator. Day 3, 05:49: Electric Motor failure in No. 1 Reactor Coolant Pump. Day 3, 10:19: HMS Titan docked at Belfast, United Kingdom for refit. Day 7, 10:19: HMS Titan departed Belfast. Day 7, 10:27: Patrol ended. Day 1, 06:53: Ship sunk: MV Santa Cruz (Iranian Large Cargo Ship). Day 1, 07:45: Ship sunk: MV Sarandí (Iranian Oil Tanker). Day 1, 07:45: HMS Richmond successfully engaged enemy shipping near 55 N 12 W.
Day 1, 08:27: Governor failure in No. 2 Steam Turbine. Day 1, 08:28: Patrol ended. Mission log of British submarine HMS Richmond. Day 1, 13:08: Malfunction occured in Primary Coolant Pipes of No. 1 Reactor. Day 1, 19:33: Ship sunk: SS (Cuban Large Cargo Ship). Day 1, 19:33: HMS Richmond destroyed the important enemy vessel SS . Day 1, 22:19: Ship sunk: MV Algonquin (Canadian Large Cargo Ship). Day 1, 22:19: HMS Richmond destroyed the important enemy vessel MV Algonquin. Day 2, 01:12: Ship sunk: Hailong (Chinese Luda Class Destroyer). Day 2, 01:12: Ship sunk: Shenzhen (Chinese Luda Class Destroyer). Day 2, 01:13: Ship sunk: Zhu Yu (Chinese Luda Class Destroyer). Day 2, 01:13: Ship sunk: Changchun (Chinese Luda Class Destroyer). Day 2, 01:13: Ventilation System failure in Torpedo Fuel Storage. Day 2, 05:14: Malfunction in No. 1 Turbine. Day 2, 05:14: Ship sunk: Ensdorf (East German Tarantul Class Corvette). Day 2, 05:14: Fire suppression system malfunction in command centre. Day 2, 06:00: Major fault detected in No. 2 Reactor coolant pump. Day 2, 08:11: Malfunction occured in Reactor Core of No. 2 Reactor. Day 2, 08:48: Seaman Samuel Saunders drowned. Day 2, 08:50: HMS Richmond docked at Devonport, United Kingdom for refit. Day 9, 08:50: HMS Richmond departed Devonport. Day 9, 08:52: Malfunction in No. 1 Turbine. Day 9, 12:59: HMS Richmond performed reconnaissance of Tripoli port facilities. Day 9, 13:56: Malfunction in No. 1 Turbine. Day 9, 13:57: Ship sunk: Chung Haejin (North Korean Sariwon Class Corvette). Day 9, 13:57: HMS Richmond successfully engaged enemy shipping near 41 N 17 E.
Day 9, 18:41: Ship sunk: SS Pelicano (Venezuelan Large Cargo Ship). Day 9, 22:20: Ship sunk: Sinsegi (North Korean Sariwon Class Corvette). Day 9, 22:20: HMS Richmond successfully engaged enemy shipping near 64 N 23 E.
Day 10, 04:33: Reactor Core failure in No. 2 Reactor. Day 10, 05:41: Patrol ended. Day 10, 05:58: Ship sunk: MV Behemoth (Israeli Large Cargo Ship). Day 10, 07:00: Major fault detected in No. 2 Reactor coolant pump. Day 10, 08:27: Fire suppression system malfunction in command centre. Day 10, 08:27: Turbine generator malfunction. 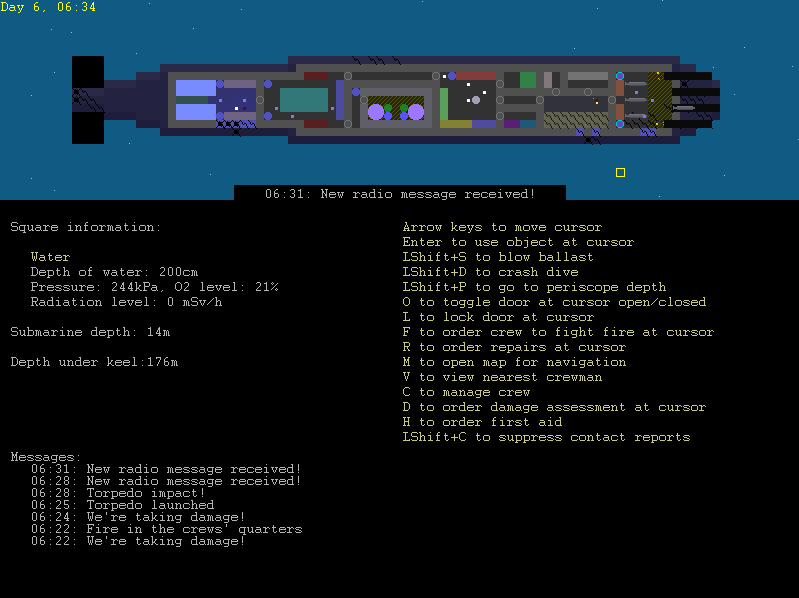 Day 10, 14:54: Hydraulics failure in Periscope. Day 10, 19:21: Ship sunk: SS Angamos (Chilean Large Cargo Ship). Day 10, 19:21: Ship sunk: Lynch (Chilean Sa'ar 4 Class Missile Boat). Day 10, 19:22: HMS Richmond was attacked with depth charges by Cochrane, a Chilean County Class Destroyer. Day 10, 19:23: Ship sunk: Angamos (Chilean Sa'ar 4 Class Missile Boat). Day 10, 19:23: HMS Richmond was attacked by a Chilean P-3 Orion. Day 10, 19:29: Chief Petty Officer Jon Price drowned. Day 10, 19:29: Seaman Cliff Morris drowned. Day 10, 19:29: Seaman Samuel Saunders drowned. Day 10, 19:32: Ensign Cade Windsor drowned. Day 10, 19:43: Patrol ended. Day 1, 05:50: Patrol started in Glasgow, United Kingdom. Day 1, 06:08: Patrol ended. Mission log of British submarine HMS Canterbury. Day 1, 11:41: Turbine generator malfunction. Day 1, 12:19: Fire in the Fore Torpedo Room. Day 1, 12:37: HMS Canterbury was fired on by Katerina, a Soviet Victor III Class Attack Submarine. Day 1, 12:37: HMS Canterbury was fired on by Tula, a Soviet Victor III Class Attack Submarine. Day 1, 12:37: HMS Canterbury was fired on by Yelna, a Soviet Victor III Class Attack Submarine. Day 1, 12:37: Ship sunk: Katerina (Soviet Victor III Class Attack Submarine). Day 1, 12:37: Malfunction in No. 1 Turbine. Day 1, 12:37: Ship sunk: Yelna (Soviet Victor III Class Attack Submarine). Day 1, 12:37: Ship sunk: Kuznikov (Soviet Kashin Class Destroyer). Day 1, 12:37: HMS Canterbury engaged a Soviet battlegroup, sinking the important enemy vessel Kuznikov. Day 1, 12:38: Ship sunk: Tomsk (Soviet Sverdlov Class Cruiser). Day 1, 12:42: Major fault detected in No. 1 Reactor coolant pump. Day 1, 12:44: Fire suppression system malfunction in engine room. Day 1, 12:47: HMS Canterbury docked at Istanbul, Turkey for refit. Day 6, 12:47: HMS Canterbury departed Istanbul. Day 6, 12:49: Major fault detected in No. 1 Reactor coolant pump. Day 6, 12:49: Ship sunk: Kuzbass (Soviet Tarantul Class Corvette). Day 6, 13:57: Patrol ended. Day 6, 20:02: Fire suppression system malfunction in command centre. Day 6, 21:36: Turbine generator malfunction. Day 6, 23:55: Impeller failure in Bilge Pump. Day 7, 00:45: HMS Canterbury performed reconnaissance of Capetown port facilities. Day 7, 02:34: Turbine generator malfunction. Day 7, 04:57: Fire suppression system malfunction in generator room. Day 7, 10:46: Fire suppression system malfunction in generator room. Day 7, 10:59: Ship sunk: SS Comodoro Rivadavia (Libyan Large Cargo Ship). Day 7, 11:01: Ship sunk: Castillo (Libyan Koni Class Frigate). Day 7, 11:01: HMS Canterbury destroyed the important enemy vessel Castillo. Day 7, 11 Ship sunk: Robinson (Libyan Koni Class Frigate). Day 7, 13:58: Patrol ended. Day 7, 16:56: HMS Canterbury performed reconnaissance of Kaliningrad port facilities. Day 7, 21:08: Major fault detected in No. 1 Reactor coolant pump. Day 7, 22:32: HMS Canterbury performed reconnaissance of Arkhangelsk port facilities. Day 8, 02:51: HMS Canterbury performed reconnaissance of Den Helder port facilities. Day 8, 03:30: Patrol ended. Day 8, 04:48: Major fault detected in No. 1 Reactor coolant pump. Day 8, 04:49: Ship sunk: MV Augsburg (East German Oil Tanker). Day 8, 04:49: HMS Canterbury successfully engaged enemy shipping near 55 N 10 E.
Day 8, 06:14: Patrol ended. Day 8, 09:44: Lens failure in Periscope. Day 8, 12 HMS Canterbury performed reconnaissance of Alexandria port facilities. Day 8, 17:53: HTP Tank failure in Torpedo Fuel Storage. Day 8, 22:24: Ensign Caleb Middleton died of radiation poisoning. Day 9, 07:37: HMS Canterbury performed reconnaissance of Cartegena port facilities. Day 9, 09:20: Patrol ended. Day 9, 15:31: Fire suppression system malfunction in command centre. Day 9, 22:36: Malfunction in No. 2 Turbine. Day 9, 22:55: Fire suppression system malfunction in engine room. Day 10, 04:47: Ship sunk: ARC Padilla (Colombian Allen M. Summner Class Destroyer). Day 10, 04:47: Ship sunk: ARC Independiente (Colombian Allen M. Summner Class Destroyer). Day 10, 04:51: Ship sunk: SS Caquetá (Colombian Oil Tanker). Day 10, 08:15: Malfunction occured in Reactor Core of No. 2 Reactor. Day 10, 08:15: Ship sunk: ARC Magdalena (Colombian Allen M. Summner Class Destroyer). Day 10, 10:47: HMS Canterbury performed reconnaissance of La Rochelle port facilities. Day 10, 10:50: Patrol ended. Day 10, 11 Major fault detected in No. 2 Reactor coolant pump. Day 10, 11 Ship sunk: MV (Cuban Large Cargo Ship). Day 10, 11:18: HMS Canterbury docked at Devonport, United Kingdom for refit. Day 16, 11:18: HMS Canterbury departed Devonport. Day 16, 11:18: Patrol ended. Day 16, 14 Malfunction in No. 2 Turbine. Day 16, 14 Ship sunk: SS (Cuban Oil Tanker). Day 16, 14:23: Turbine generator malfunction. Day 17, 00:59: Ship sunk: Moltke (East German Koni Class Frigate). Day 17, 00:59: HMS Canterbury destroyed the important enemy vessel Moltke. Day 17, 01:10: Ship sunk: MV Pelosi (Italian Large Cargo Ship). Day 17, 01:26: Fire in the Fore Torpedo Room. Day 17, 01:26: Ensign Caleb Middleton was killed in an explosion. Day 17, 01:39: Seaman Christian Hammond drowned. Day 17, 04:00: HMS Canterbury docked at Narvik, Norway for refit. Day 23, 04:00: HMS Canterbury departed Narvik. Day 23, 04:05: Patrol ended. Day 23, 05:59: Ship sunk: Luoyang (Chinese Luda Class Destroyer). Day 23, 05:59: Ship sunk: Yulin (Chinese Luda Class Destroyer). Day 23, 05:59: Ship sunk: Taikang (Chinese Luda Class Destroyer). Day 23, 06:00: Fire suppression system malfunction in command centre. Day 23, 06 Malfunction in No. 1 Turbine. Day 23, 06:16: Malfunction occured in Primary Coolant Pipes of No. 1 Reactor. Day 23, 06:19: Patrol ended. Day 23, 10:45: HMS Canterbury was fired on by USS Toledo, a US Sturgeon Class Attack Submarine. Day 23, 10:45: HMS Canterbury was fired on by USS Tampa, a US Sturgeon Class Attack Submarine. Day 23, 10:45: HMS Canterbury was fired on by USS Albany, a US Sturgeon Class Attack Submarine. Day 23, 10:45: Ship sunk: USS Tampa (US Sturgeon Class Attack Submarine). Day 23, 10:45: HMS Canterbury was attacked with depth charges by USS Chattanooga, a US Charles F. Adams Class Destroyer. Day 23, 10:45: Ship sunk: USS Albany (US Sturgeon Class Attack Submarine). Day 23, 10:45: HMS Canterbury was attacked with depth charges by USS Provider, a US Charles F. Adams Class Destroyer. Day 23, 10:45: Ship sunk: USS Chattanooga (US Charles F. Adams Class Destroyer). Day 23, 10:45: HMS Canterbury was attacked with depth charges by USS Ticonderoga, a US Allen M. Summner Class Destroyer. Day 23, 10:45: HMS Canterbury was attacked with depth charges by USS La Jolla, a US Allen M. Summner Class Destroyer. Day 23, 10:46: Patrol ended. Day 1, 05:50: Patrol started in Belfast, United Kingdom. Day 1, 06:05: Patrol ended. ission log of British submarine HMS Illustrious. Day 1, 08:24: Ship sunk: SS Robinson (Egyptian Large Cargo Ship). Day 1, 08:32: Ship sunk: SS Indómita (Egyptian Large Cargo Ship). Day 1, 08:32: HMS Illustrious successfully engaged enemy shipping near 57 N 12 E.
Day 1, 10:00: Patrol ended. Mission log of British submarine HMS Illustrious. Day 1, 11:24: Major fault detected in No. 1 Reactor coolant pump. Day 1, 19:01: Electric Motor failure in No. 1 Reactor Coolant Pump. Day 2, 05:23: Fire suppression system malfunction in engine room. Day 2, 05:24: HMS Illustrious performed reconnaissance of Karachi port facilities. Day 2, 08 Governor failure in Turbine Generator. Day 2, 08:11: HMS Illustrious was fired on by Barnaul, a Soviet Victor III Class Attack Submarine. Day 2, 08:11: Ship sunk: Karelia (Soviet Tarantul Class Corvette). Day 2, 08:11: Ship sunk: Barnaul (Soviet Victor III Class Attack Submarine). Day 2, 08:11: Ship sunk: Petrozavodsk (Soviet Sverdlov Class Cruiser). Day 2, 08:12: Wiring/Cables failure in Electric Motor. Day 2, 08:13: Captain Alexander McLachlan died from injuries. Day 2, 08:13: Lieutenant William Lawson died from injuries. Day 2, 08:13: Lieutenant Matthew Hammond drowned. Day 2, 08:13: Lieutenant Blair Davis drowned. Day 2, 10:24: Fire suppression system malfunction in engine room. Day 2, 16 HMS Illustrious docked at Stanley, United Kingdom for refit. Day 8, 16 HMS Illustrious departed Stanley. Day 8, 16 Patrol ended at Stanley, United Kingdom. Day 8, 20:00: Ship sunk: Samara (Soviet Sverdlov Class Cruiser). Day 8, 20:00: Ship sunk: Bratisk (Soviet Kashin Class Destroyer). Day 8, 20:00: Ship sunk: Katerina (Soviet Koni Class Frigate). Day 8, 20:00: Ship sunk: Zelenograd (Soviet Kashin Class Destroyer). Day 8, 20:00: HMS Illustrious was attacked with depth charges by Smolensk, a Soviet Koni Class Frigate. Day 8, 20:00: HMS Illustrious was attacked with depth charges by Tigr, a Soviet Kashin Class Destroyer. Day 8, 20:02: Fire in the Fore Torpedo Room. Day 8, 20:11: Seaman Benjamin Trueman drowned. Day 8, 20:11: Chief Petty Officer Benjamin Pegg drowned. Day 8, 20:11: Ensign Brodie Clark drowned. Day 8, 20:11: Seaman Benjamin Morris drowned. Day 8, 20:11: Seaman Jon Kennedy drowned. Day 8, 20:12: Patrol ended. Day 1, 05:50: Patrol ended at Norfolk, USA. Mission log of US submarine USS McKinley. Day 1, 06:36: Ship sunk: SS Nerpal (Soviet Oil Tanker). Day 1, 06:36: USS McKinley destroyed the important enemy vessel SS Nerpal. Day 1, 06:47: Patrol ended. Day 1, 08:10: Ship sunk: MV Belgrano (Libyan Oil Tanker). Day 1, 09:00: Major fault detected in No. 2 Reactor coolant pump. Day 1, 12:02: Ship sunk: Tula (Soviet Sverdlov Class Cruiser). Day 1, 12:02: Ship sunk: Kola (Soviet Koni Class Frigate). Day 1, 12:16: Ship sunk: Iribis (Soviet Sverdlov Class Cruiser). 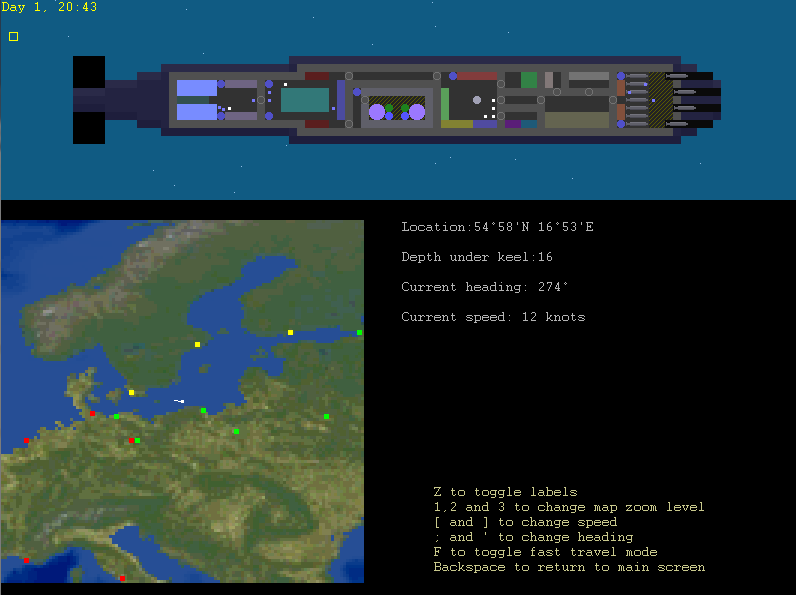 Day 1, 12:17: Ship sunk: Iribis (Soviet Sverdlov Class Cruiser). Day 1, 14:13: Malfunction occured in Pressure Vessel of No. 1 Reactor. Day 1, 15:49: Turbine generator malfunction. Day 1, 17:39: USS McKinley docked at Norfolk, USA for refit. Day 6, 17:39: USS McKinley departed Norfolk. Day 6, 17:41: Patrol ended at Norfolk, USA. Day 6, 22:27: Ship sunk: SS Klas Horn (Finnish Small Cargo Ship). Day 6, 22:27: USS McKinley destroyed the important enemy vessel SS Klas Horn. Day 6, 23:18: Turbine generator malfunction. Day 6, 23:40: Major fault detected in No. 1 Reactor coolant pump. Day 7, 10:09: Malfunction in No. 2 Turbine. Day 7, 10:27: Malfunction occured in Nuclear Fuel of No. 2 Reactor. Day 7, 14:20: USS McKinley performed reconnaissance of Stanley port facilities. Day 7, 14:21: Patrol ended at Stanley, United Kingdom. Day 7, 17:30: Ship sunk: Intrépida (Egyptian Koni Class Frigate). Day 7, 17:34: Ship sunk: MV Intrépida (Egyptian Large Cargo Ship). Day 7, 17:34: USS McKinley destroyed the important enemy vessel MV Intrépida. Day 7, 18:17: Turbine generator malfunction. Day 7, 20:40: Fire suppression system malfunction in fore torpedo room. Day 8, 00:05: Ship sunk: SS Fersen (Finnish Large Cargo Ship). Day 8, 00:59: Ship sunk: ORP Lech (Polish Tarantul Class Corvette). Day 8, 04:27: Major fault detected in No. 2 Reactor coolant pump. Day 8, 07:20: Turbine generator malfunction. Day 8, 07:21: Ship sunk: MV La Argentina (Egyptian Oil Tanker). Day 8, 07:21: Ship sunk: La Argentina (Egyptian Koni Class Frigate). Day 8, 07:23: Ship sunk: Gurruchaga (Egyptian Koni Class Frigate). Day 8, 07:23: USS McKinley destroyed the important enemy vessel Gurruchaga. Day 8, 10:30: Patrol ended. Day 8, 11:56: Fire in the Fore Torpedo Room. Day 8, 14:38: Major fault detected in No. 2 Reactor coolant pump. Day 8, 15:42: USS McKinley docked at Norfolk, USA for refit. Day 15, 15:42: USS McKinley departed Norfolk. Day 15, 15:44: Patrol ended at Norfolk, USA. Day 15, 17:58: Fire suppression system malfunction in command centre. Day 16, 01:58: USS McKinley successfully engaged enemy shipping near 71 N 38 E.
Day 16, 03:13: Malfunction occured in Nuclear Fuel of No. 1 Reactor. Day 16, 05:19: Turbine generator malfunction. Day 16, 05:44: USS McKinley performed reconnaissance of Oslo port facilities. Day 16, 06:21: Patrol ended. Day 16, 09:21: Ship sunk: HMS Indomitable (British County Class Destroyer). Day 16, 09:21: USS McKinley was attacked with depth charges by HMS Indomitable, a British County Class Destroyer. Day 16, 09:21: USS McKinley was attacked by a British Nimrod MR1. Day 16, 09:23: Patrol ended. Day 1, 05:58: Malfunction in No. 2 Turbine. Day 1, 05:58: Major fault detected in No. 1 Reactor coolant pump. Day 1, 08:40: Malfunction occured in Reactor Core of No. 1 Reactor. Day 1, 08:40: Ship sunk: SS Grom (Polish Large Cargo Ship). Day 1, 08:40: USS Boise destroyed the important enemy vessel SS Grom. Day 1, 10:29: Malfunction in No. 2 Turbine. Day 1, 11:31: USS Boise performed reconnaissance of Cartegena port facilities. Day 1, 11:31: Fire in the Fore Torpedo Room. Day 1, 11:31: Chief Petty Officer Brennon Alfonso drowned. Day 1, 11:56: Seaman Aaron Bracken died of radiation poisoning. Day 1, 12:52: Turbine generator malfunction. Day 1, 13:45: Seaman Michael Shields died from injuries. Day 1, 13:45: USS Boise docked at Tampa, USA for refit. Day 7, 13:45: USS Boise departed Tampa. Day 7, 13:47: Patrol ended at Tampa, USA. Day 7, 15:05: Turbine generator malfunction. Day 7, 22:14: Major fault detected in No. 1 Reactor coolant pump. Day 7, 22:20: Ship sunk: Zhanjiang (Chinese Luda Class Destroyer). Day 7, 22:20: USS Boise successfully engaged enemy shipping near 56 N 0 E.
Day 7, 22:21: Major fault detected in No. 1 Reactor coolant pump. Day 7, 22:46: Malfunction occured in Pressure Vessel of No. 1 Reactor. Day 7, 22:50: Lieutenant Seth Smith died from injuries. Day 7, 22:53: USS Boise was fired on by Chelyabinsk, a Soviet Sverdlov Class Cruiser. Day 7, 22:53: USS Boise was fired on by Kuzbass, a Soviet Sverdlov Class Cruiser. Day 7, 22:53: USS Boise was fired on by Moskovskiy, a Soviet Koni Class Frigate. Day 7, 22:53: USS Boise was fired on by Petrozavodsk, a Soviet Sverdlov Class Cruiser. Day 7, 22:53: USS Boise was fired on by Irkutsk, a Soviet Koni Class Frigate. Day 7, 22:53: Ship sunk: Chelyabinsk (Soviet Sverdlov Class Cruiser). Day 7, 22:54: Ship sunk: Moskovskiy (Soviet Koni Class Frigate). Day 7, 22:54: Lieutenant Alec Tracy died from injuries. Day 7, 22:54: Captain Bruce Brooks drowned. Day 7, 22:54: USS Boise was fired on by Yegorlik, a Soviet Victor III Class Attack Submarine. Day 7, 22:54: USS Boise was fired on by Novomoskovsk, a Soviet Victor III Class Attack Submarine. Day 7, 22:54: Patrol ended. Day 1, 05:51: Major fault detected in No. 1 Reactor coolant pump. Day 1, 05:52: Patrol ended. Mission log of US submarine USS Fillmore. Day 1, 09:31: Malfunction in No. 1 Turbine. Day 1, 15:30: Malfunction in No. 1 Turbine. Day 1, 15:44: USS Fillmore performed reconnaissance of Florianopolis port facilities. Day 1, 21:42: Seaman Clayton Nelson died of radiation poisoning. Day 1, 22:04: Ship sunk: MV Castillo (Libyan Large Cargo Ship). Day 1, 22:04: USS Fillmore successfully engaged enemy shipping near 24 N 46 W.
Day 2, 00:02: Turbine generator malfunction. Day 2, 00:04: Ship sunk: SS Überherrn (East German Oil Tanker). Day 2, 00:04: USS Fillmore destroyed the important enemy vessel SS Überherrn. Day 2, 00:49: Patrol ended. Day 2, 01:20: Condenser failure in No. 2 Reactor Heat Exchanger. Day 2, 01:22: CRT Display failure in Primary Turbine Control Panel. Day 2, 06:07: USS Fillmore was fired on by Zumashedsniy, a Soviet Victor III Class Attack Submarine. Day 2, 06:07: USS Fillmore was fired on by Oktyabr, a Soviet Victor III Class Attack Submarine. Day 2, 06:08: Ship sunk: Katerina (Soviet Koni Class Frigate). Day 2, 06:08: USS Fillmore was attacked with depth charges by Petrozavodsk, a Soviet Koni Class Frigate. Day 2, 06:08: USS Fillmore was attacked with depth charges by Katerina, a Soviet Kashin Class Destroyer. Day 2, 06:08: USS Fillmore was attacked with depth charges by Goryn, a Soviet Koni Class Frigate. Day 2, 06:08: Ship sunk: Yelna (Soviet Tarantul Class Corvette). Day 2, 06:08: Ensign Peyton Sosa drowned. Day 2, 06:09: Lieutenant Edward Rodríguez died from injuries. Day 2, 06:09: Chief Petty Officer Sean Underwood was killed in an explosion. Day 2, 06:09: Seaman Cooper Chandler died from injuries. Day 2, 06:09: Captain Seth Hoffman drowned. Day 2, 06:09: Seaman Ethan Bauer drowned. Day 2, 06:09: Seaman Joel Ming drowned. Day 2, 06:09: Lieutenant Kyle Daniels died from injuries. Day 2, 06:09: Seaman Frank Hazell drowned. Day 2, 06:09: Chief Petty Officer Brian Ming drowned. Day 2, 06:10: Lieutenant Joel Sosa drowned. Day 2, 06:10: Ensign Devon Costanza drowned. Day 2, 06:11: Patrol ended. 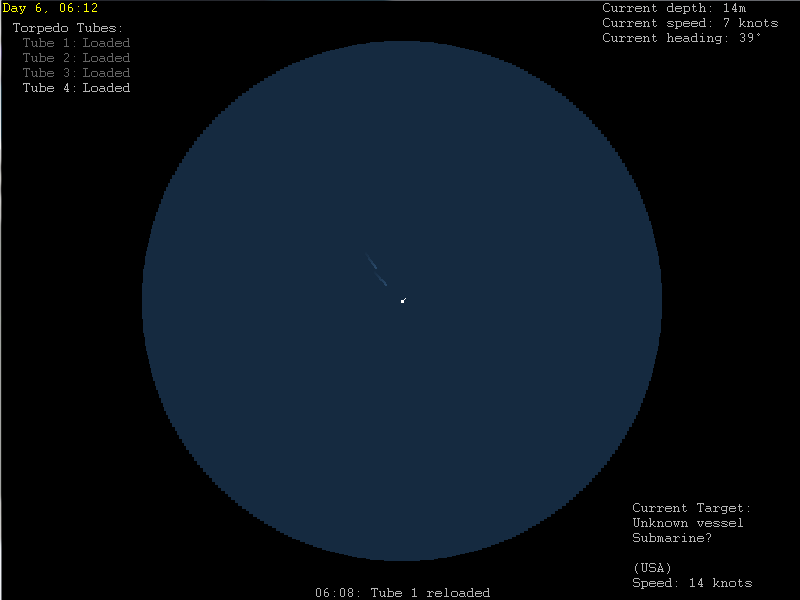 Day 1, 06:01: Ventilation System failure in Torpedo Fuel Storage. Day 1, 06:02: Fire in the Fore Torpedo Room. Day 1, 06:02: Fire suppression system malfunction in engine room. Day 1, 06:07: Patrol ended. Mission log of US submarine USS Olympia. Day 1, 09:16: Fire suppression system malfunction in generator room. Day 1, 12:16: Ship sunk: Lianyungang (Chinese Luda Class Destroyer). Day 1, 12:16: Ship sunk: Cheng Pu (Chinese Luda Class Destroyer). Day 1, 12:16: Ship sunk: Zhou Yu (Chinese Luda Class Destroyer). Day 1, 12:17: Fire suppression system malfunction in generator room. Day 1, 12:27: Ship sunk: Zhu Yu (Chinese Luda Class Destroyer). Day 1, 12:27: USS Olympia engaged a Chinese battlegroup, sinking the important enemy vessel Zhu Yu. Day 1, 12:47: Fire suppression system malfunction in engine room. Day 1, 12:48: Patrol ended. Day 1, 20:46: Ship sunk: Brandenburg (East German Tarantul Class Corvette). Day 1, 22:32: Fire suppression system malfunction in reactor antechamber. Day 2, 01:15: Ship sunk: MV Torun (Polish Small Cargo Ship). Day 2, 01:15: USS Olympia destroyed the important enemy vessel MV Torun. Day 2, 05:44: USS Olympia docked at Honolulu, USA for refit. Day 8, 05:44: USS Olympia departed Honolulu. Day 8, 06:44: Major fault detected in No. 1 Reactor coolant pump. Day 8, 12:18: Malfunction in No. 2 Turbine. Day 8, 12:24: Patrol ended. Day 8, 21:34: Malfunction in No. 1 Turbine. Day 9, 01:50: Major fault detected in No. 1 Reactor coolant pump. Day 9, 08:11: Fire suppression system malfunction in engine room. Day 9, 11:41: Turbine generator malfunction. Day 9, 19:11: USS Olympia performed reconnaissance of Buenos Aires port facilities. Day 9, 19:37: Patrol ended. Day 10, 01:28: Major fault detected in No. 2 Reactor coolant pump. Day 10, 03:17: USS Olympia performed reconnaissance of Havana port facilities. Day 10, 03:38: Fire suppression system malfunction in sonar room. Day 10, 07:24: Fire suppression system malfunction in generator room. Day 10, 07:29: Malfunction occured in Primary Coolant Pipes of No. 2 Reactor. Day 10, 14:29: USS Olympia performed reconnaissance of Halifax port facilities. Day 10, 15:01: Patrol ended. Day 10, 21:22: Malfunction occured in Pressure Vessel of No. 1 Reactor. Day 11, 00:18: Ship sunk: Ulsan (North Korean Sariwon Class Corvette). Day 11, 00:18: USS Olympia destroyed the important enemy vessel Ulsan. Day 11, 03:52: Turbine generator malfunction. Day 11, 08:21: Fire suppression system malfunction in generator room. Day 11, 12:21: Malfunction in No. 1 Turbine. Day 11, 12:23: USS Olympia performed reconnaissance of Havana port facilities. Day 11, 14:02: Turbine generator malfunction. Day 11, 14:16: USS Olympia docked at Jacksonville, USA for refit. Day 17, 14:16: USS Olympia departed Jacksonville. Day 17, 14:25: Patrol ended. Day 17, 19:41: Ship sunk: ORP Orkan (Polish Kashin Class Destroyer). Day 18, 01:50: Ship sunk: MV Moskovskiy (Soviet Small Cargo Ship). Day 18, 01:54: Ship sunk: MV Quebec (Canadian Large Cargo Ship). Day 18, 01:54: Ship sunk: SS Calgary (Canadian Large Cargo Ship). Day 18, 02:54: Patrol ended. Day 1, 06:01: Patrol ended. Day 1, 06:29: CRT Display failure in Power Systems Control Panel. Day 1, 06:29: Malfunction occured in Nuclear Fuel of No. 1 Reactor. Day 1, 10:53: Malfunction occured in Control Rods of No. 1 Reactor. Day 1, 12:30: Ship sunk: Katyusha (Soviet Koni Class Frigate). Day 1, 12:30: USS Olympia destroyed the important enemy vessel Katyusha. Day 1, 12:30: Ship sunk: Leopard (Soviet Kashin Class Destroyer). Day 1, 12:30: Ship sunk: Rys (Soviet Kashin Class Destroyer). Day 1, 12:59: USS Olympia was fired on by Zelenograd, a Soviet Victor III Class Attack Submarine. Day 1, 12:59: USS Olympia was fired on by Laptev, a Soviet Victor III Class Attack Submarine. Day 1, 12:59: Ship sunk: Laptev (Soviet Victor III Class Attack Submarine). Day 1, 12:59: USS Olympia destroyed the important enemy vessel Severstal. Day 1, 13 Seaman Jacob Brown drowned. Day 1, 13 Seaman Noah Jacobson died from injuries. Day 1, 13:22: Turbine generator malfunction. Day 1, 15:12: Malfunction in No. 2 Turbine. Day 1, 17 USS Olympia docked at La Rochelle, France for refit. Day 8, 17 USS Olympia departed La Rochelle. Day 8, 17:08: Patrol ended. Day 8, 20:24: Ship sunk: MV Hindenburg (East German Large Cargo Ship). Day 8, 20:24: USS Olympia successfully engaged enemy shipping near 72 N 9 E.
Day 8, 20:41: Turbine generator malfunction. Day 8, 21:40: Patrol ended. Day 1, 07:02: Malfunction in No. 1 Turbine. Day 1, 14:09: Ship sunk: Shizhuang (Chinese Luda Class Destroyer). Day 1, 14:10: USS Springfield was attacked with depth charges by Zhuhai, a Chinese Luda Class Destroyer. Day 1, 14:10: USS Springfield was attacked with depth charges by Xuzhou, a Chinese Luda Class Destroyer. Day 1, 14:10: USS Springfield was attacked with depth charges by Anqing, a Chinese Luda Class Destroyer. Day 1, 14:10: USS Springfield was attacked with depth charges by Zhanjiang, a Chinese Luda Class Destroyer. Day 1, 14:10: USS Springfield was attacked with depth charges by Sanya, a Chinese Luda Class Destroyer. Day 1, 14:10: USS Springfield was attacked with depth charges by Changbai, a Chinese Luda Class Destroyer. Day 1, 14:10: USS Springfield was attacked with depth charges by Hengyang, a Chinese Luda Class Destroyer. Day 1, 14:10: Ship sunk: Shenzhen (Chinese Luda Class Destroyer). Day 1, 14:10: USS Springfield was attacked with depth charges by Shenzhen, a Chinese Luda Class Destroyer. Day 1, 14:11: Seaman Brody Lee drowned. Day 1, 14:11: Ensign Colin Iglesias drowned. Day 1, 14:11: Chief Petty Officer Cameron Adams drowned. Day 1, 14:12: Seaman Joshua Sinclair drowned. Day 1, 14:12: Lieutenant Joseph Walton died from injuries. Day 1, 14:12: Lieutenant Devon DiPietro drowned. Day 1, 14:12: Lieutenant James Charlebois drowned. Day 1, 14:12: Captain Walter Macasek drowned. Day 1, 14:13: Patrol ended. Day 1, 05:52: Patrol ended at New York, USA. Mission log of US submarine USS Tucson. Day 1, 13 Ship sunk: Salta (Libyan Koni Class Frigate). Day 1, 13:05: Ship sunk: MV Julio Krause (Egyptian Large Cargo Ship). Day 1, 13:07: Ship sunk: MV Cordoba (Egyptian Small Cargo Ship). Day 1, 13:10: Ship sunk: Almirante Brown (Libyan Koni Class Frigate). Day 1, 13:12: Turbine generator malfunction. Day 1, 13:44: Ship sunk: Robinson (Egyptian Koni Class Frigate). Day 1, 13:44: USS Tucson successfully engaged enemy shipping near 34 N 12 E.
Day 1, 14:42: Turbine generator malfunction. Day 1, 14:43: Turbine generator malfunction. Day 1, 15:44: Patrol ended.